Kitchens are such versatile rooms. We use them to cook meals for ourselves and our families daily. They hold homework on the island or table. 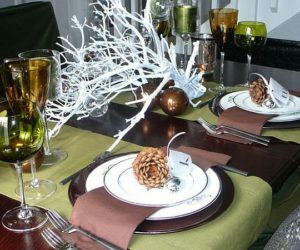 They show off cheese plates and pies when we host parties. 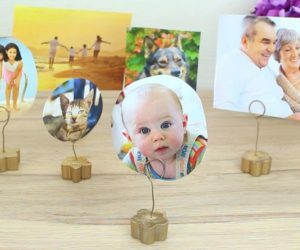 They become the hub of the home, all work and life revolving around them. So it’s important that our kitchens are not only efficient but beautiful as well. Nobody wants to wash dishes in a dingy space. Firstly, you’ll want to choose your base color. 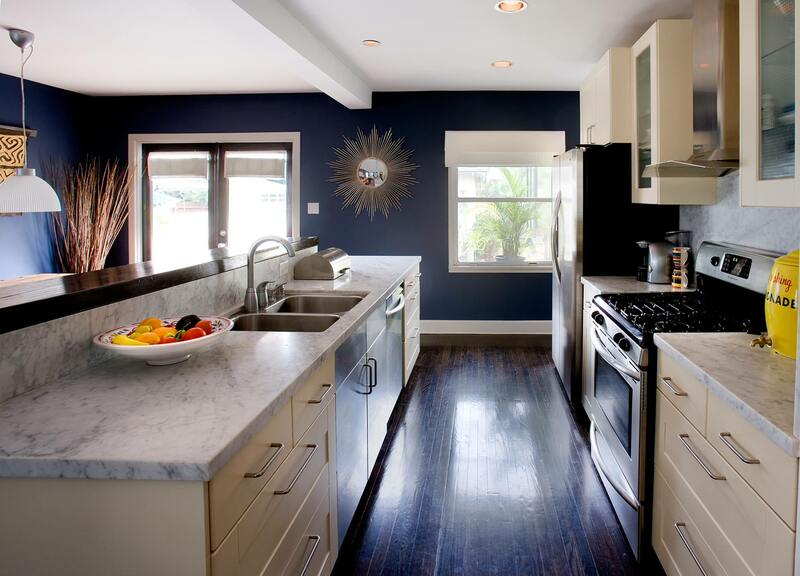 The color you paint the walls will greatly influence how your kitchen feels in the end. 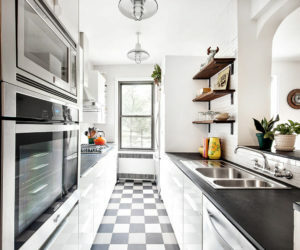 Once that is decided, you can choose which cabinet orientation gives the best flow and which flooring is the easiest to clean and if you should hang your pots and pans or store them in a cabinet. 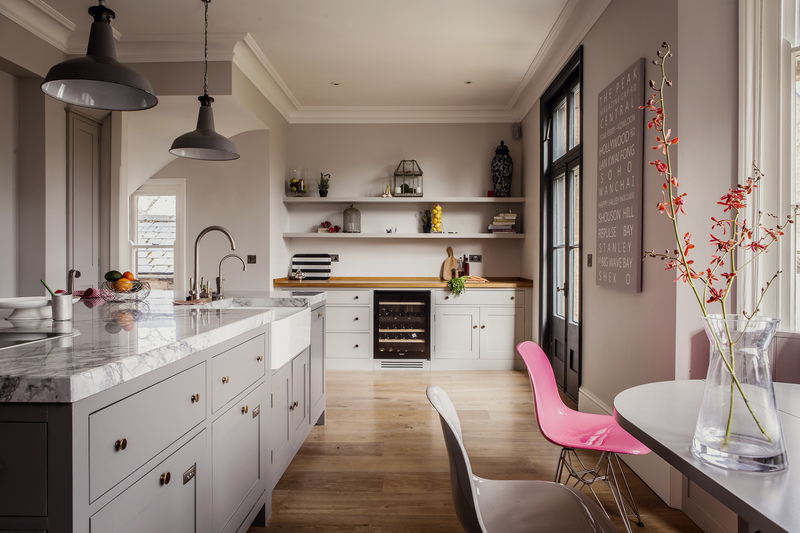 There are a lot of decisions to make so take some time to scroll through these 100 beautiful kitchens to inspire your own kitchen makeover. You’ll end up with the kitchen you’ve always dreamed of. White would be considered one of the go to colors for kitchens, but that shouldn’t always be the case. 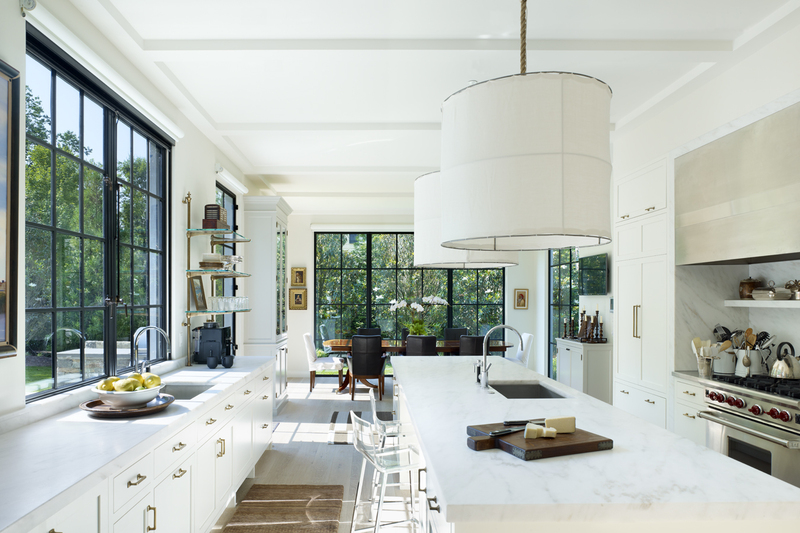 Designer knows that big windows make a white kitchen look bright and fresh, the way that white should look. 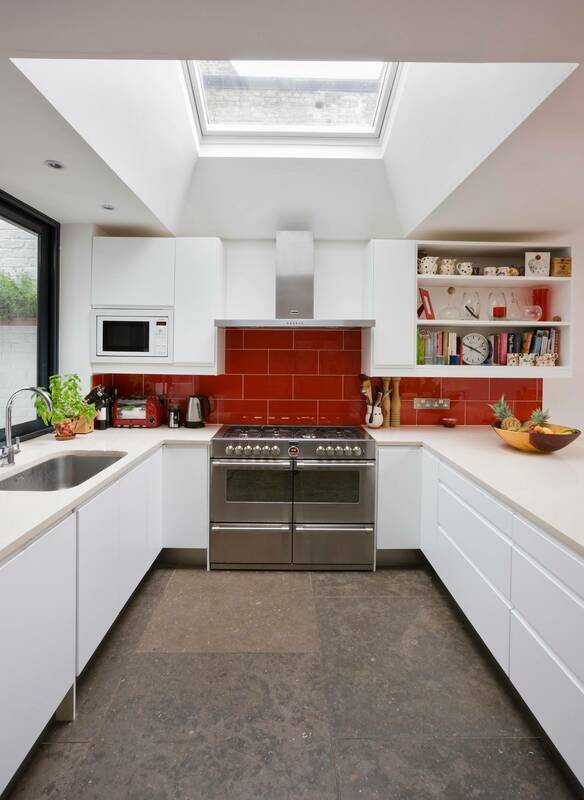 So make sure you have plenty of natural light in your kitchen to really set off those white walls. If you can say yes to marble, then say a big enthusiastic yes. 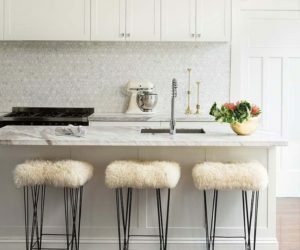 shows us that marble paired with white can be an incredibly chic kitchen combination. Especially with that tiled marble backsplash. 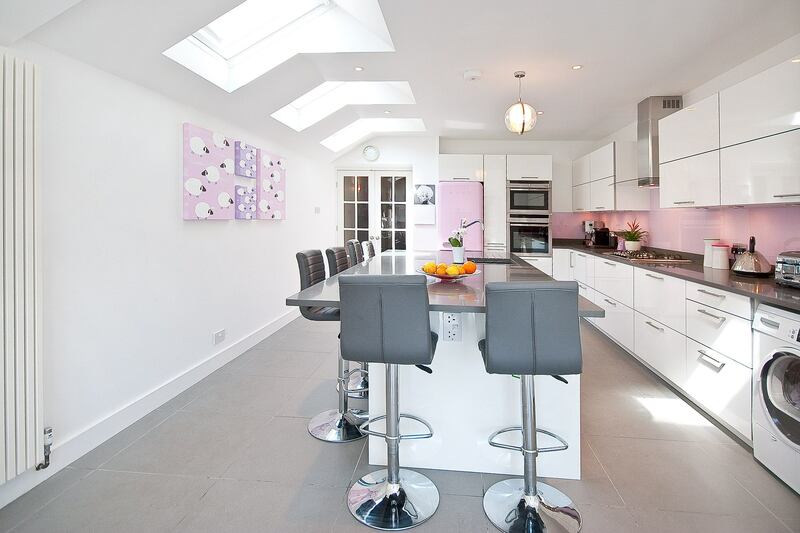 should be applauded for creating this lovely white kitchen. 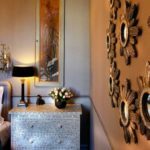 Focused on simplicity, it is a prime example of how neutral colors can complement each other so well and complete a room without a brighter shade. 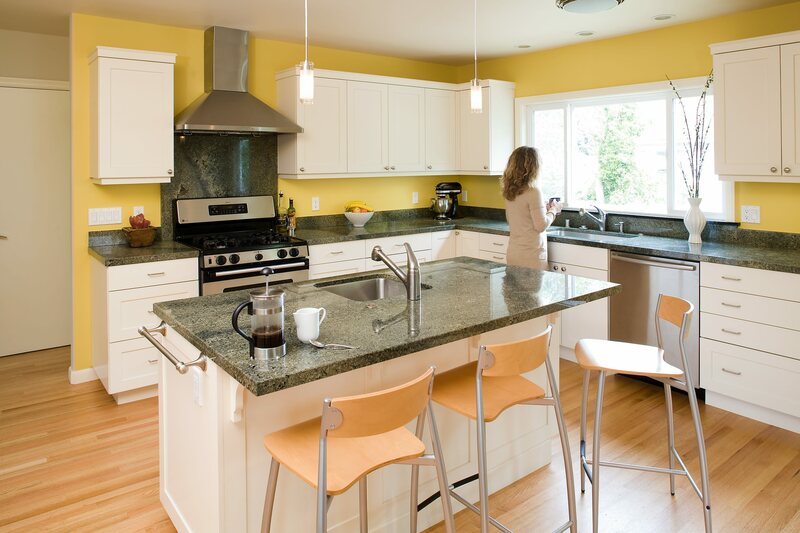 Of course there is no harm in putting a brighter shade into your neutral colored kitchen. 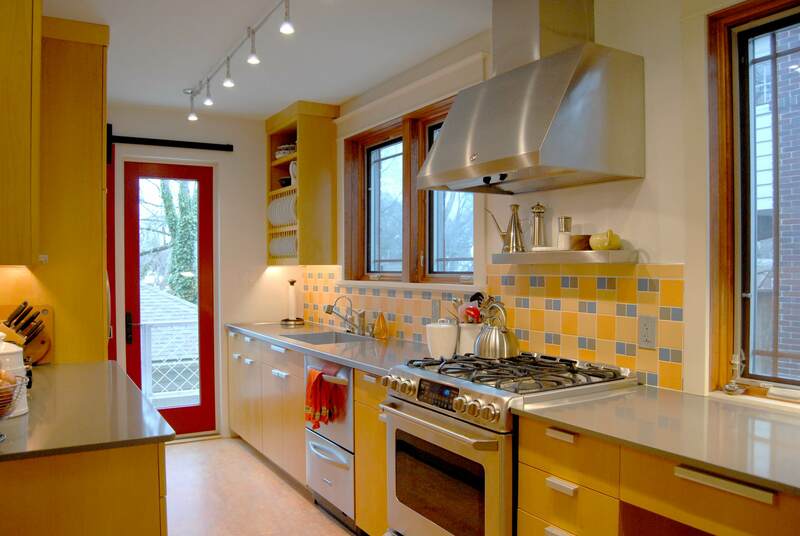 They chose a bright yellow stove to contrast against dark cabinets and white walls. 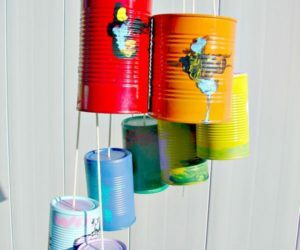 Such an unexpected pop can bring a smile to your kitchen space. Can we talk about cabinets for a second? Just because your walls are white doesn’t mean your cabinets must be white too. 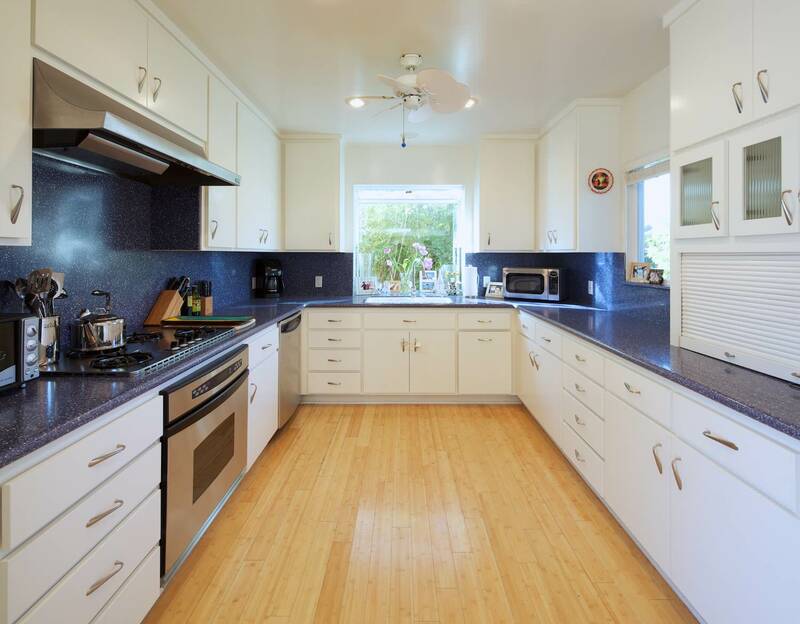 In fact, choosing a darker color for cabinets like navy cabinets can set your kitchen apart from the basic Joe kitchen. 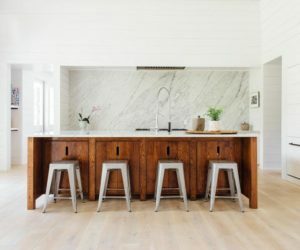 Shiplap is trending hard at the moment, which is a good thing for country kitchens. 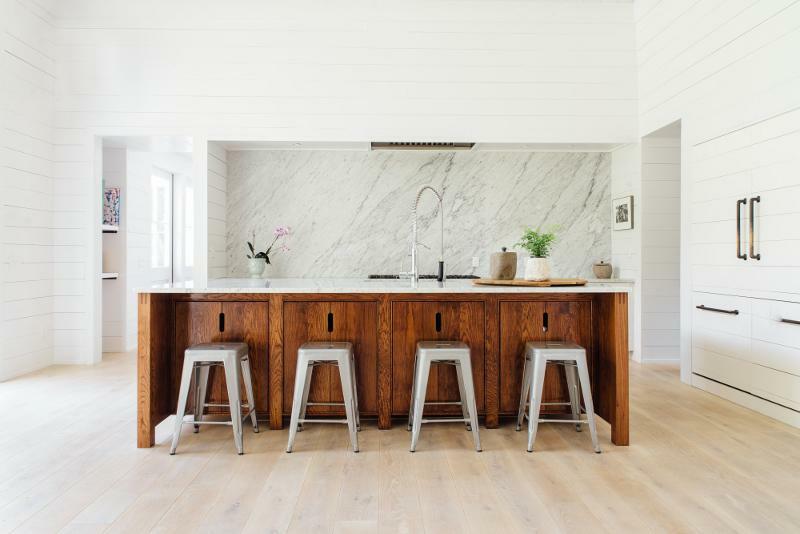 Most shiplap is white so when you cover your kitchen walls in it, you instantly create that clean rustic look without all those differing wood tones. even covers cabinet fronts in shiplap to give more continuity. 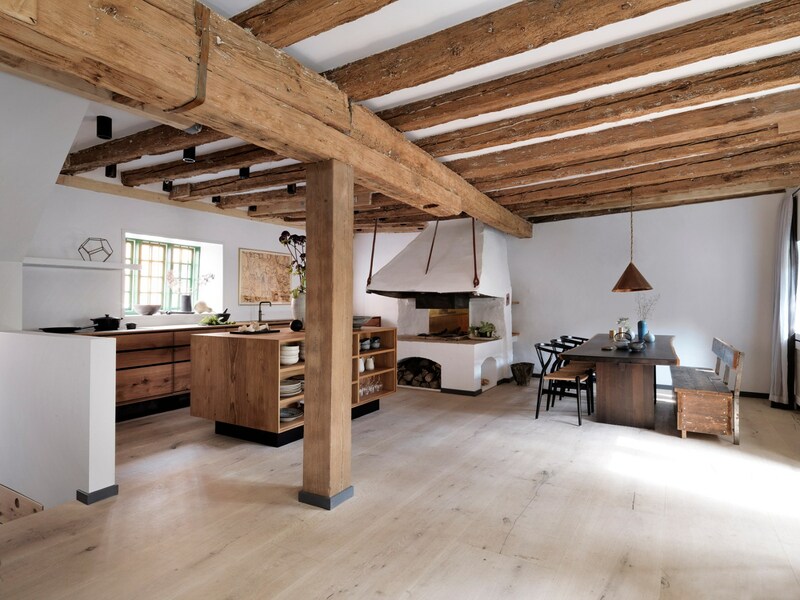 Speaking of rustic, let’s spend a moment appreciating the beams in this white kitchen. 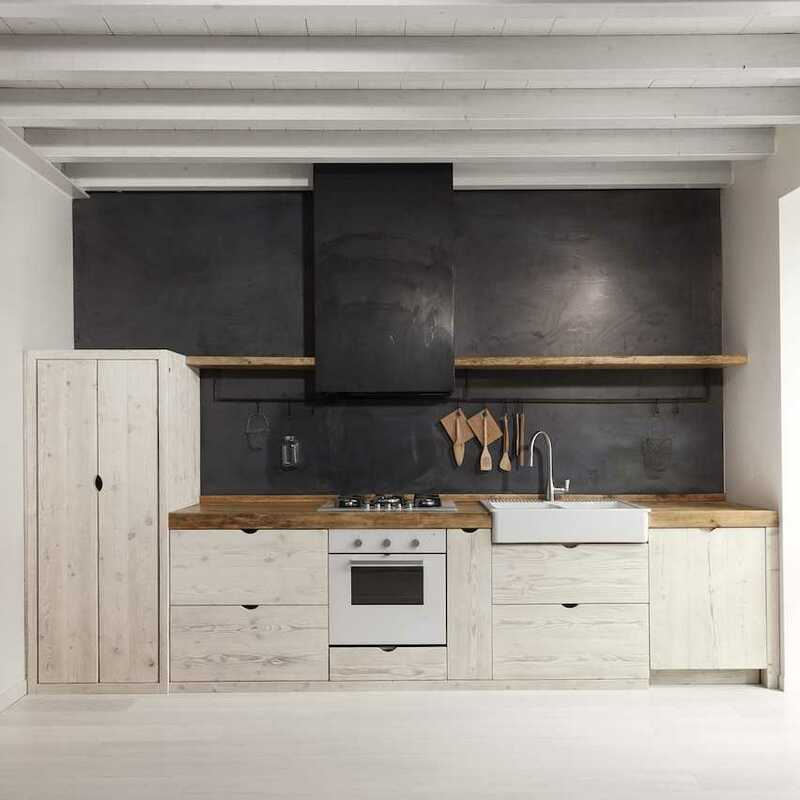 Danish design company, , uses wood of different shades to bring warmth into this kitchen. They have successfully created a space where everyone wants to spend their slow Saturday mornings. Wood floors are popular in all kitchens, no matter the color. But by choosing wood for your white kitchen, you’re using a creative avenue to bring depth and texture into an otherwise plain space. chose a lighter stain for the floor to keep things feeling fresh. You probably know already that white actually comes in different shades. Those undertones say more than you think. 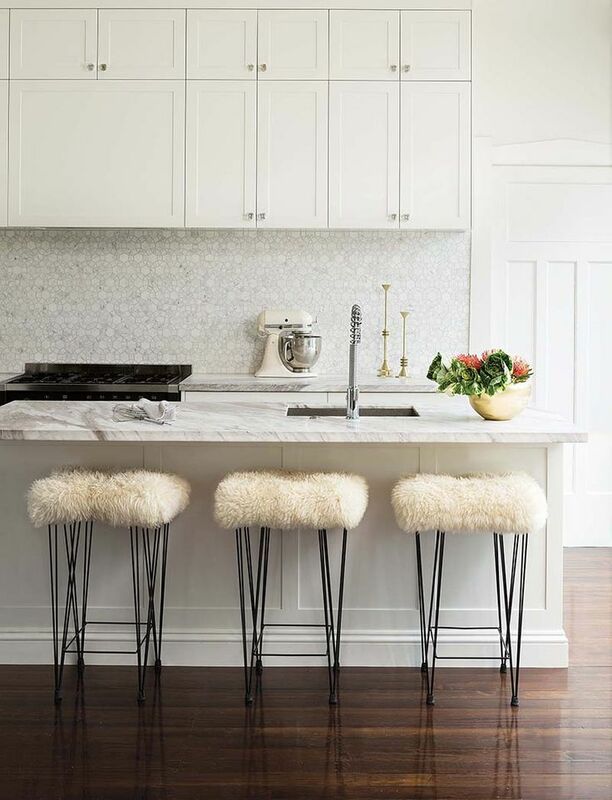 If you’re are convinced to have white in your kitchen with shadowy corners, opt for a white with to make your space feel cozy and not dingy. 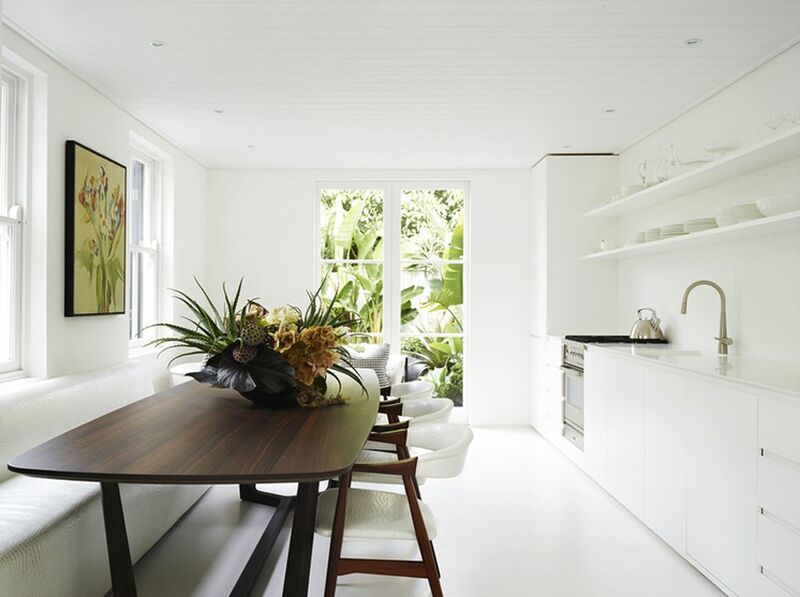 Naturally we should all take a page out of ‘ book and consider going white on white on white in our kitchens. White walls with a white floor and white cabinets put the focus where it really counts, on the people and the food. So if you’re thinking of ditching color altogether, you have our permission. 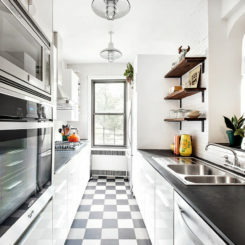 When you’re wanting to create a modern kitchen that is also family friendly, black or white are too stark when it comes to your color choices. shows us that gray is much softer and yet still neutral enough to give your metallic pops and modern sensibilities. 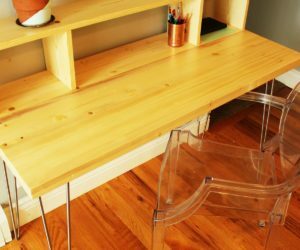 When your home has wood floors, many times it just makes sense to keep the rest of your decor on the warm side. Like when used a lovely warm gray for both the walls and the cabinet. It’s a perfect kitchen for lingering over your morning coffee. Is your kitchen basically wall to wall cabinet space? That shouldn’t inhibit you at all. 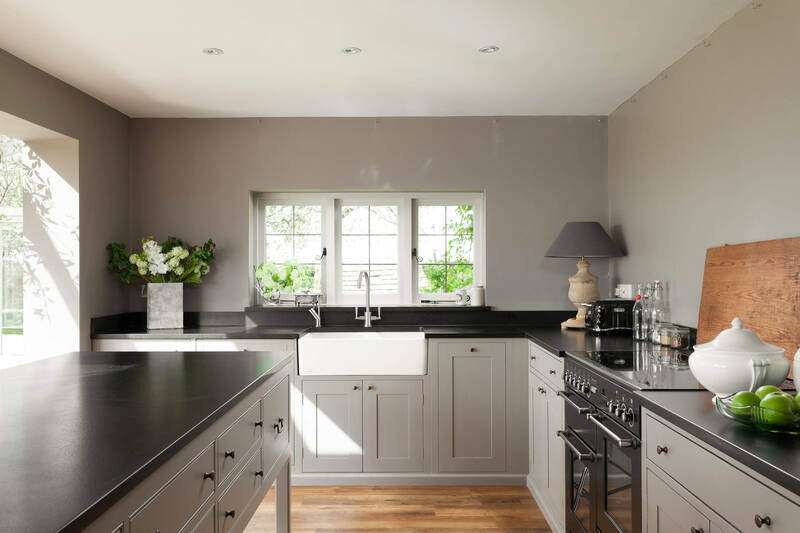 This kitchen by painted all the sleek cabinet fronts a stormy gray to make them feel more accessible though no less modern. 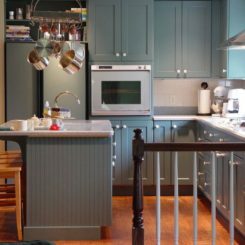 Since gray is basically pastel black, it seems only natural that you would lean towards other pastel colors in your gray kitchen. 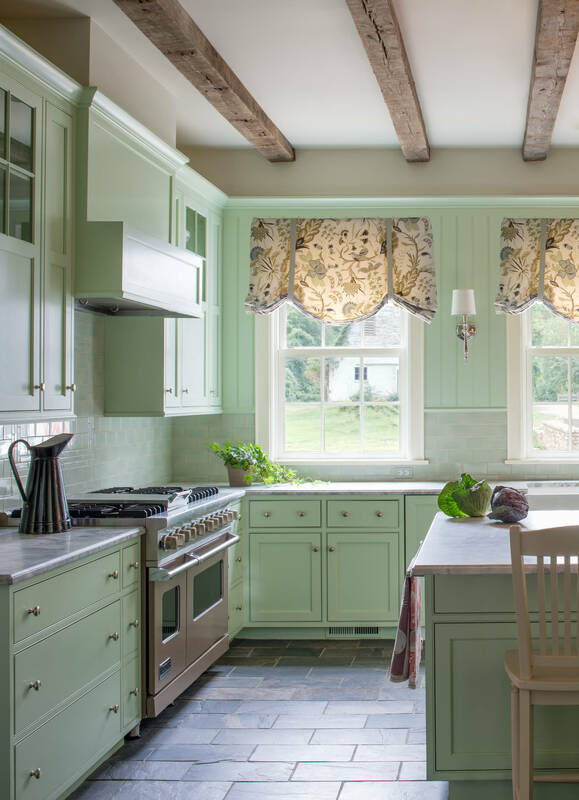 Light green, like the backsplash in , is a lovely calming choice. 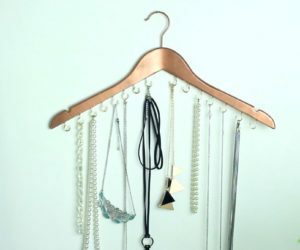 Or you could go with a blending light blue or even the trendy blush pink. Whatever you choose, it will be beautiful against your gray walls. Gray can definitely be an invitation to infuse your space with bright colors as well. 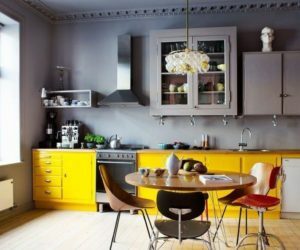 If you’re feeling like the gray is too overwhelming, take a note from this and paint your cabinets a bright color that will complement your dusky walls. Did you know that not all bricks are rusty red? Yes, there are bricks that show off colors of black and cream and gray as well. When you’re dealing with those bricks in your kitchen, teaches us to go for gray in the areas without bricks. 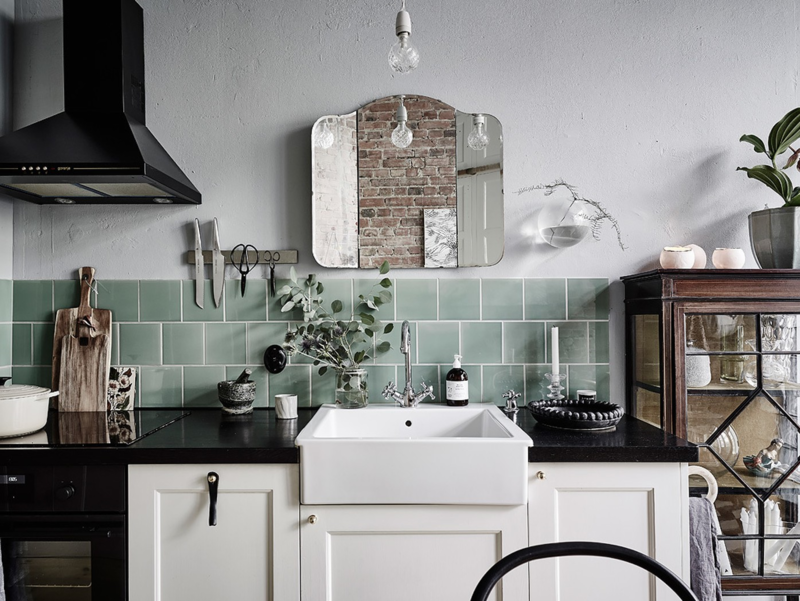 Walls cabinets, they’ll all look stunning against your brick pattern. When you think of gray and chic, you probably come up with marble. 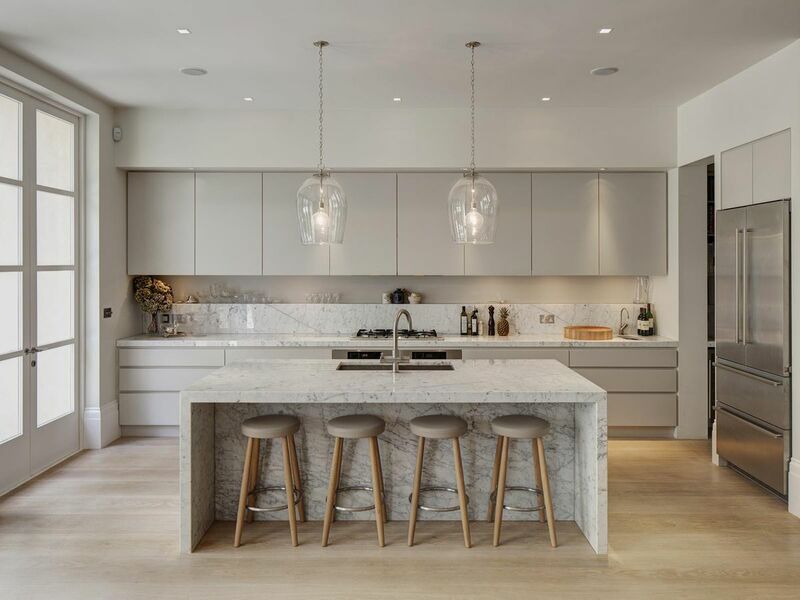 Design practice De Rosee Sa uses marble to the fullest extent in this lovely gray kitchen. 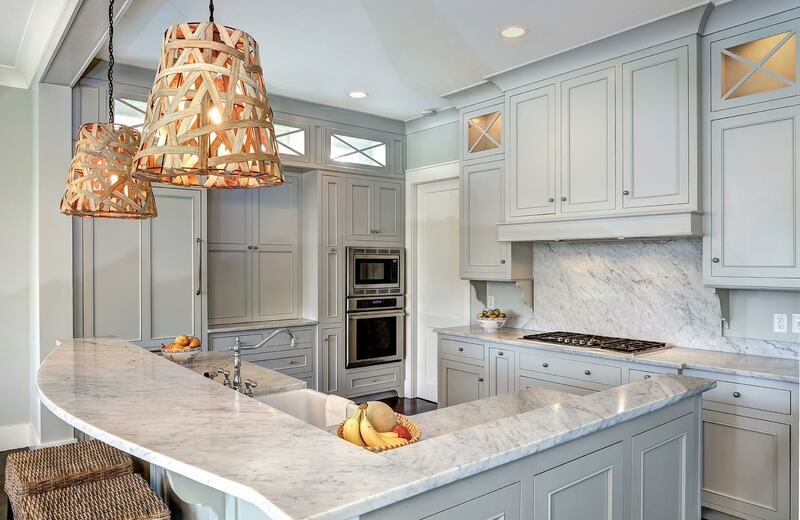 It doesn’t get much better than a completely marble kitchen island with seating and waterfall ends. 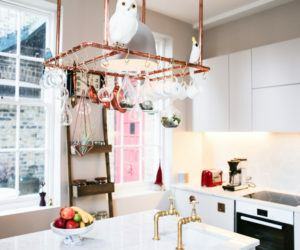 Of course it’s easy to add touches of boho style to your chic kitchen if you want to. 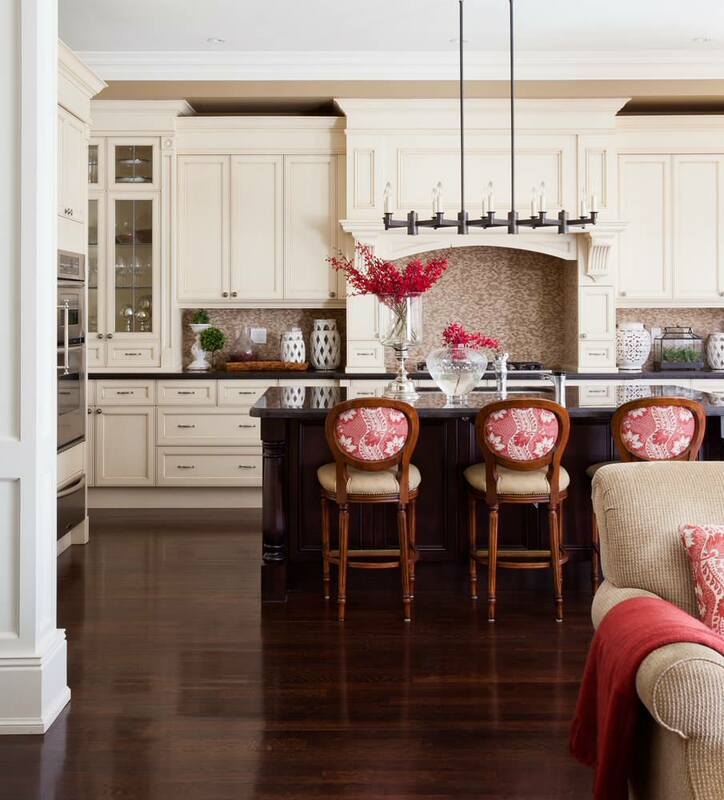 Jill Frey Kitchen Design adds the basket shades to hanging pendants to give this kitchen a touch of personality. They’re definitely one of the most eye catching things against those gray cabinets. Concrete is the new design medium and would definitely agree. 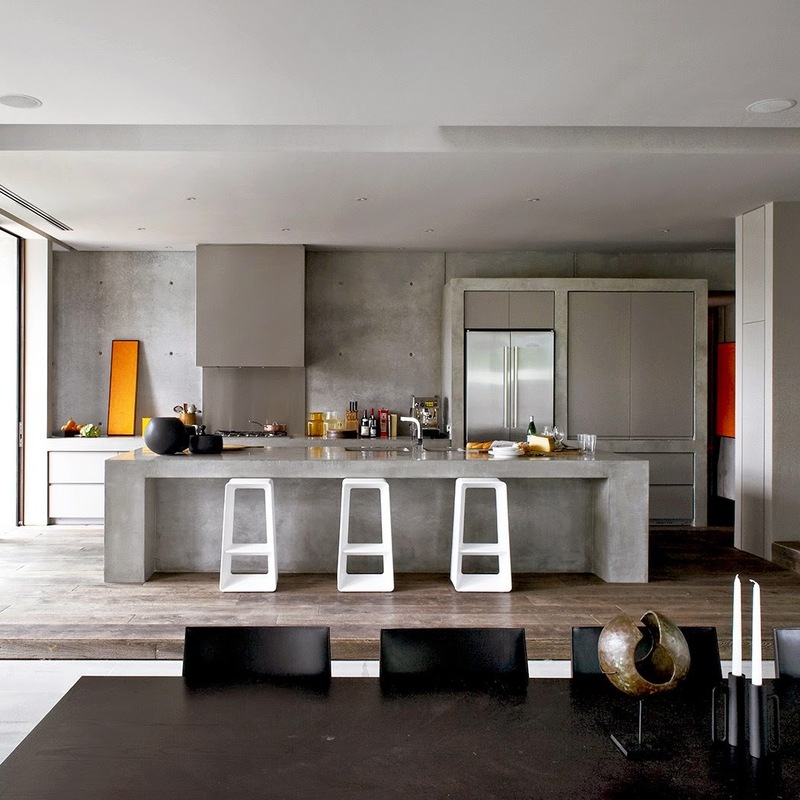 Their kitchen design is basically all concrete, which is actually a warmer gray than you’d think. You could let your kids cook and do homework and play soccer in your indestructible kitchen without losing a wink of sleep. Blue is such a popular color nowadays, it could almost be considered a neutral shade. Except it isn’t because it evokes feelings of peace and calm, exactly what you want in your kitchen while you’re trying to get the cake out of the bundt pan without cracking. 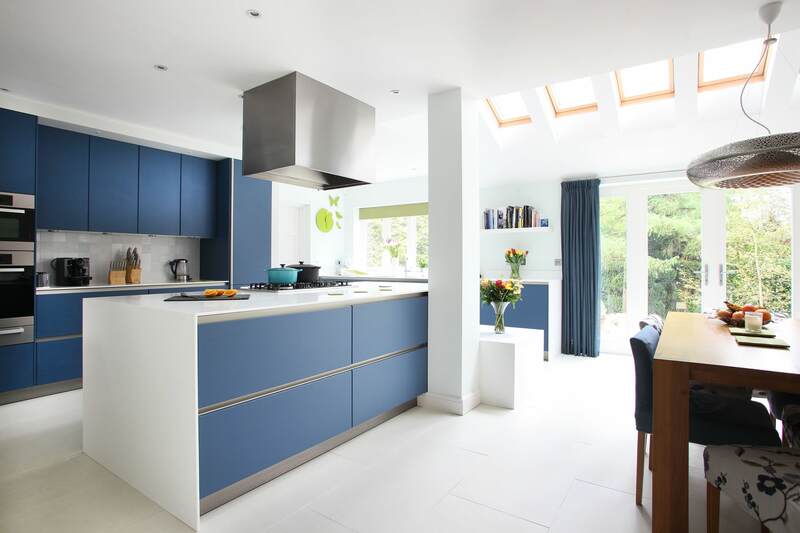 covered the walls of this kitchen with lovely blue tiles to really bring out the relaxation. 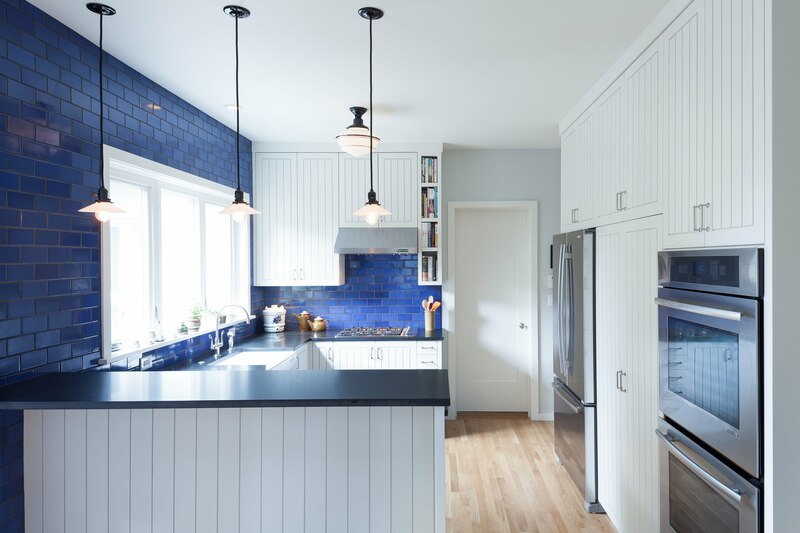 Blue tile might not be an option for your kitchen so you’ll have to find another way to get the color. Like painting your cabinet fronts blue. shows us just how effective that can be when most of your kitchen space is covered by cabinets. Famous painter Claude Monet knew his colors. 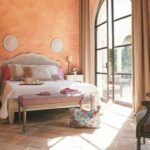 is a prime example of how different shades of the same color can give your space lots of interest without feeling overwhelming. Something to pay attention to especially when working with blue. 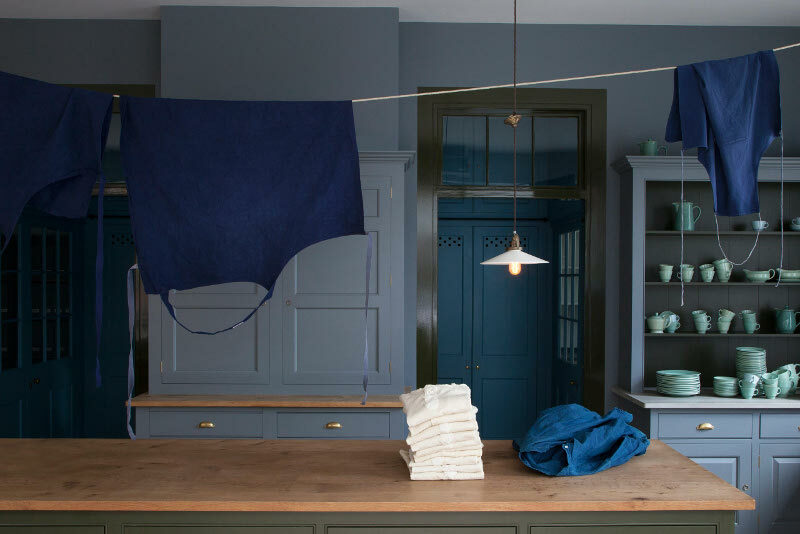 Navy is often overlooked and labelled too dark for many spaces. However, like suggests, being a darker color that isn’t black can make other elements in your kitchen really pop. Plus marble looks stunning against deep tones. 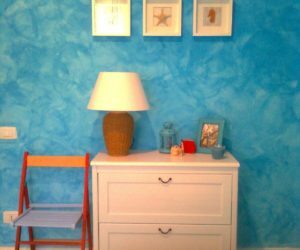 On the other end of the spectrum, many think that light blue only belongs in a nursery. 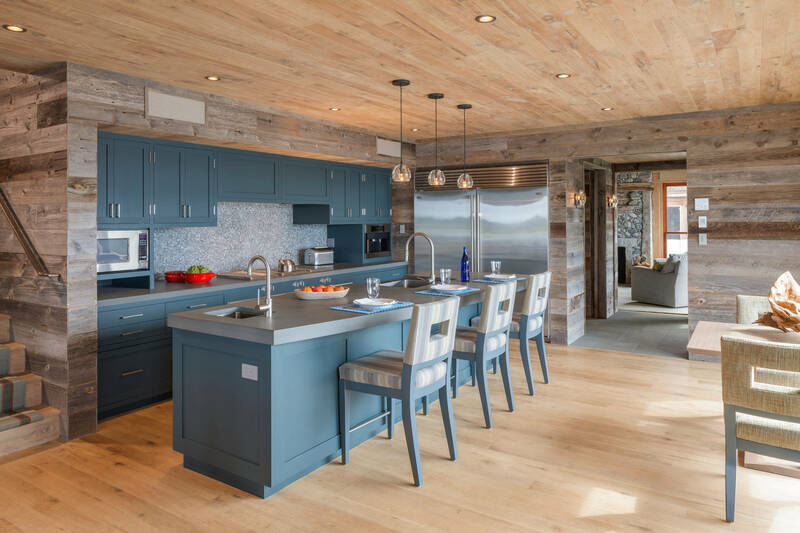 uses a pale blue to infuse this kitchen with some serious cottage vibes. If Peter Rabbit’s mother had a kitchen, this would be it. Sometimes you find a shade of blue that you just love so much and wish you could paint everything in sight that color. The question is… why not? 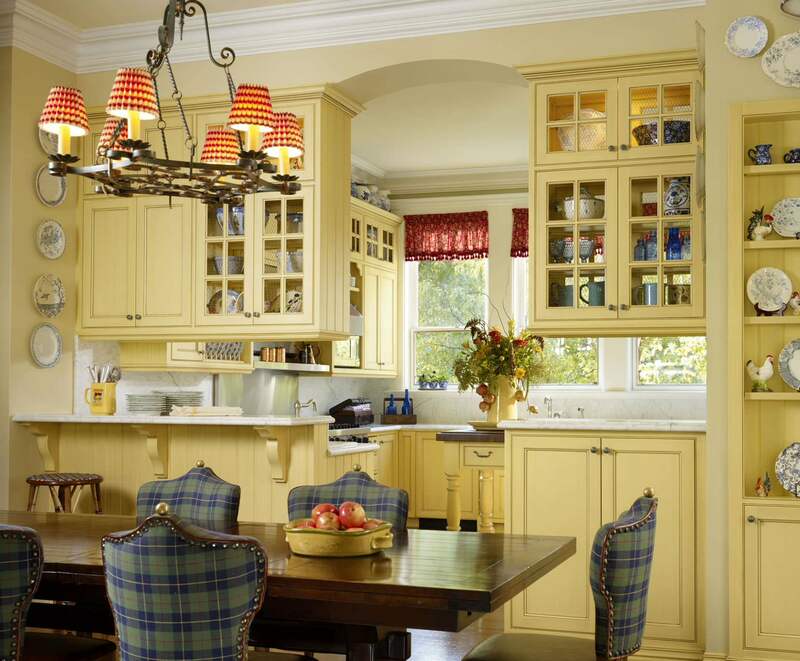 used the same shade to paint both walls and cabinets to create a very traditional feel in this traditional kitchen. When you have kids, it’s important to have surfaces that are easy to keep clean. that gets it right by giving the counter and backsplash a seamless surface. You can even have your kids help you keep that pretty blue countertop clean. You might think that smaller tiles belong in the bathroom, but shows us otherwise. 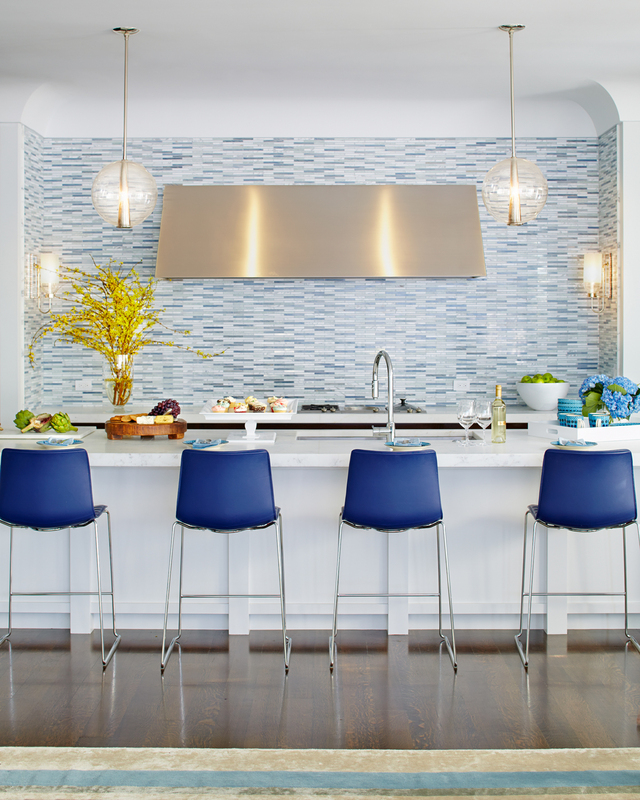 The backsplash in this kitchen is just stunning while the other blue accents pull the whole room together. There is simplicity and style in the same space that you just can’t ignore. Blue looks great in texture too. The wavy surface and gradient tones of this backsplash really brings out the rusticity of the kitchen. definitely chose well when deciding what works best with those wood cabinets. Let’s not leave out turquoise. 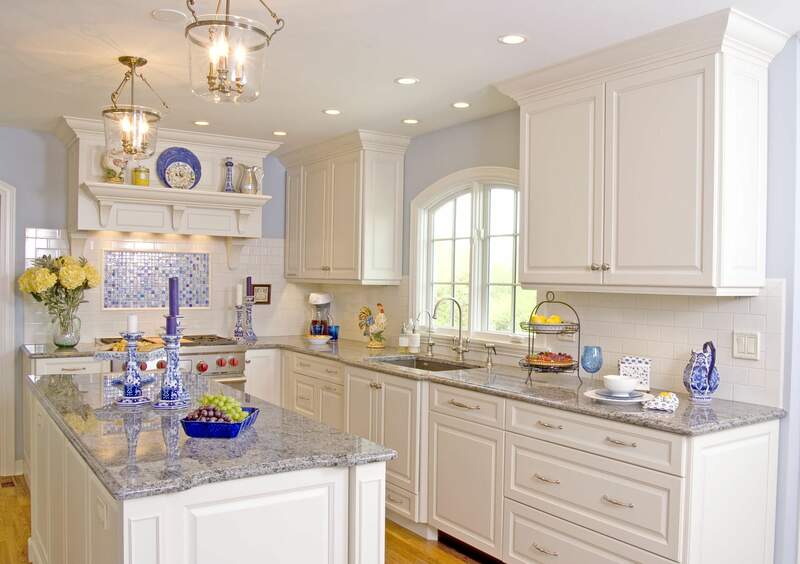 Such a popular color is a great option for the kitchen as well. really went all out on this bright and happy kitchen. You would almost believe it’s a beach house! When many people think of a red kitchen, a country kitchen comes to mind, complete with plaid valance and rooster jar. 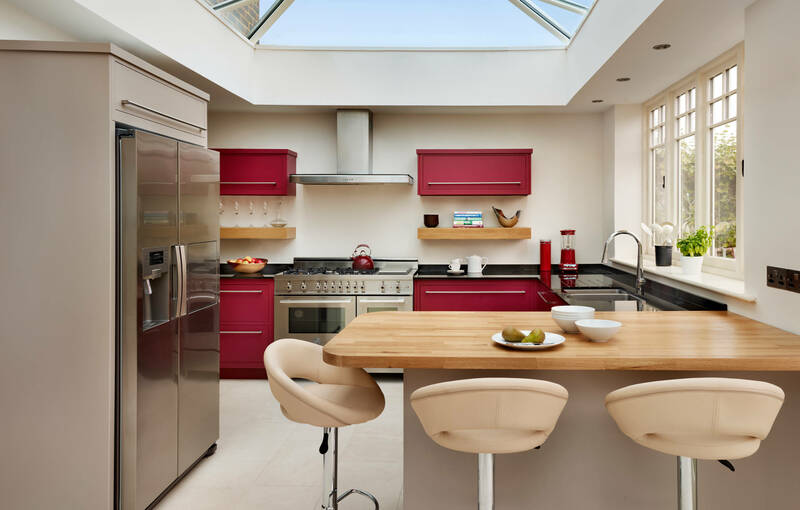 But this inspiring kitchen by shows us that red can absolutely complete a modern kitchen too. With minimal lines and shiny cabinet fronts, it banishes all thoughts of roosters from our minds. 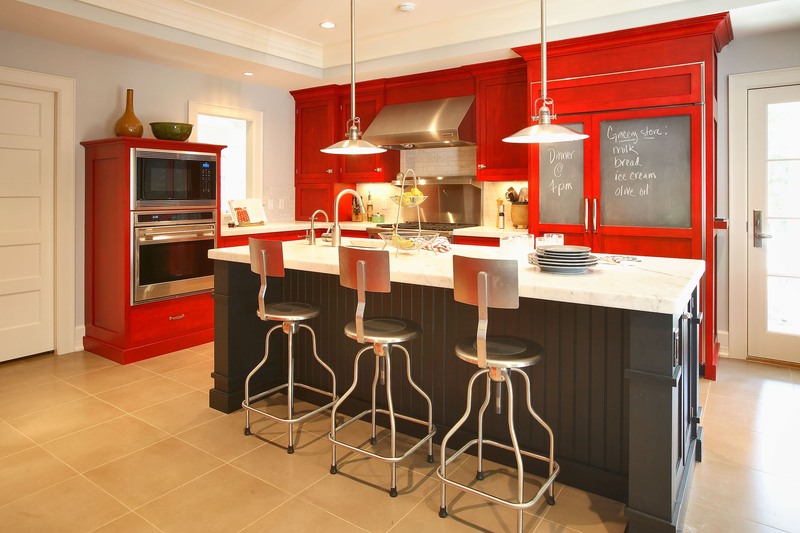 Red is definitely a fun color for eclectic kitchens as well. 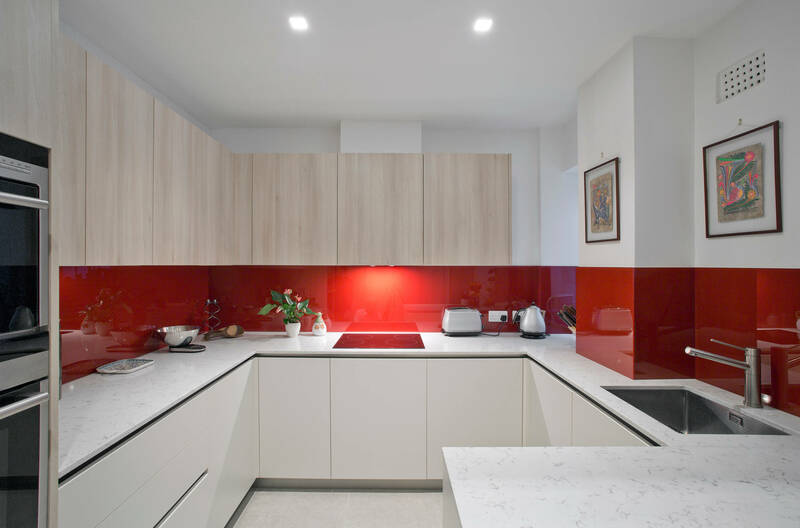 choice of the bright lipstick red for these kitchen cabinets is a bright invitation to hang out and create together as a family. Maybe you like red but you’re worried about putting it in your kitchen. Opt for a darker wine red instead. 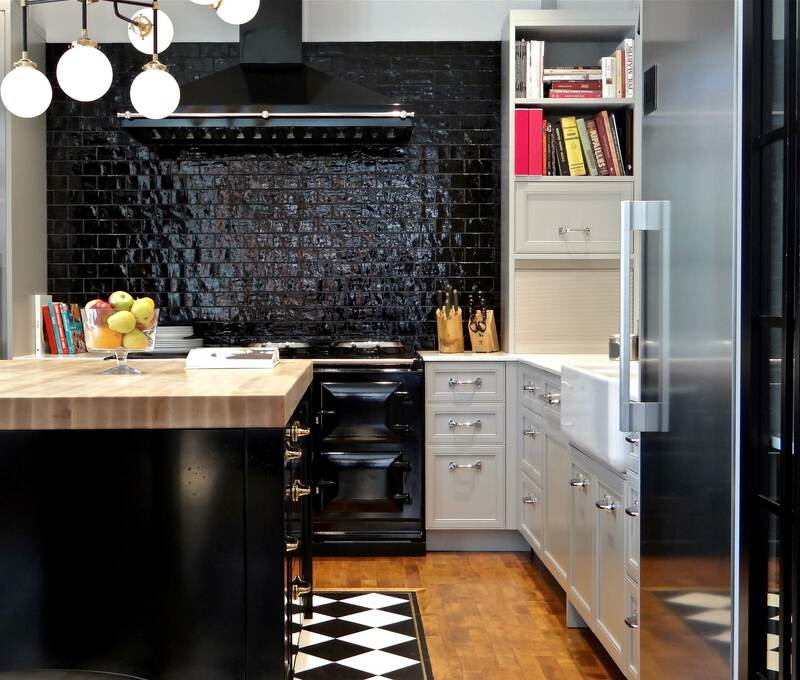 The backsplash in this kitchen is just dark enough to feel chic and classy instead of bright and punchy. Speaking of chic and classy, knows how to take chic to the next level. 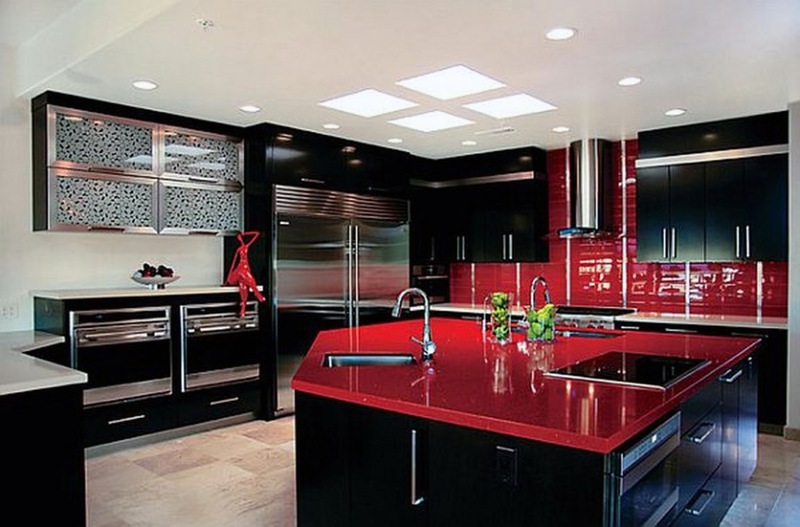 This contemporary kitchen uses red and black to give your eyes a good contrast. It will make you feel like your kitchen is much more expensive than it is. For a lighter look with the same eye drawing red, try this trick like . 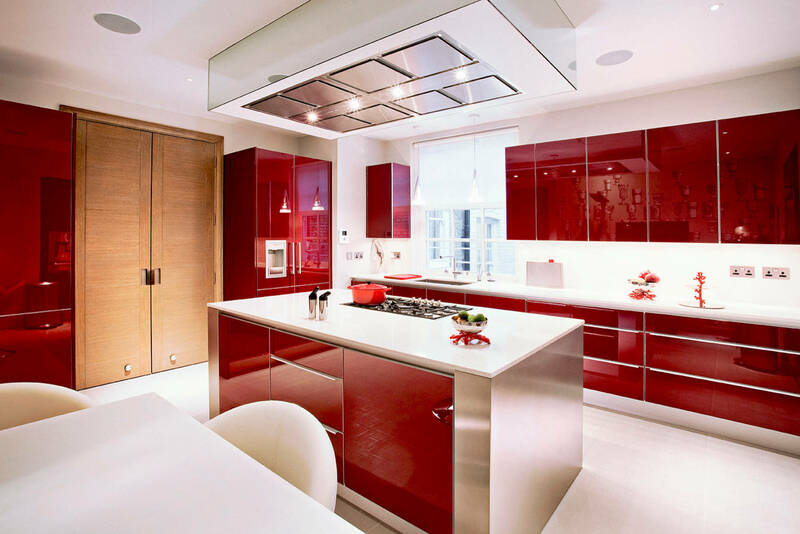 Paint the wall above your counter in your chosen shade of red and install sleek clear panels over top. You’ll get exactly the red you want in the modern style you want and still get the easy cleaning. Not the DIY type? Then go for the tiled backsplash instead. knows that just the pop of red will allow you to add all the red accents you want. There’s just something about a Spanish styled kitchen that makes you want all those spicy nachos. 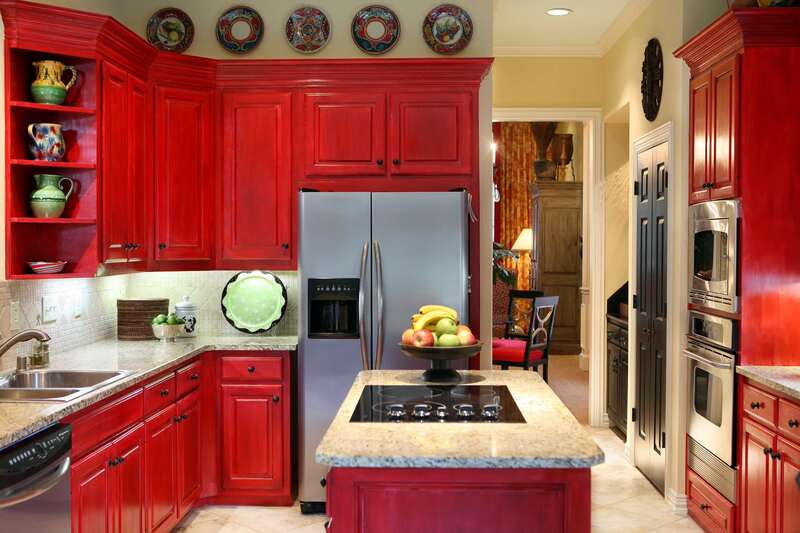 These red cabinets in this kitchen lay the foundation for the best Spanish styled kitchen you’ve ever seen. Just add terra cotta. 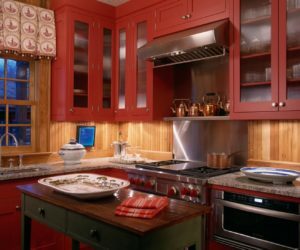 Of course if the bright red doesn’t appeal to you, add a touch of purple to the paint for a deeper wine red color like these cabinets. Suddenly your kitchen will become the space for all your selfies. From lipstick colored convertibles to I Love Lucy’s nail polish, bright red is the color of retro. That’s probably why they chose to install the lipstick red appliances in . And it was a wonderful choice. 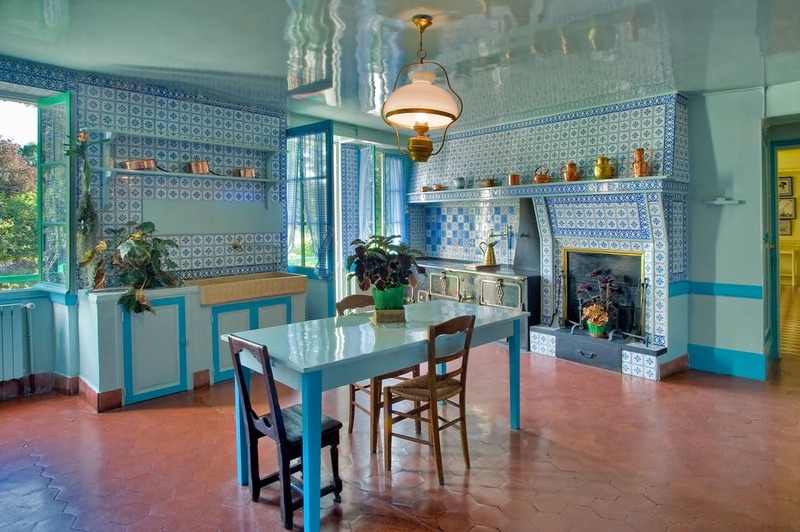 But we can’t leave out that red french country kitchen because it’s not all bad. 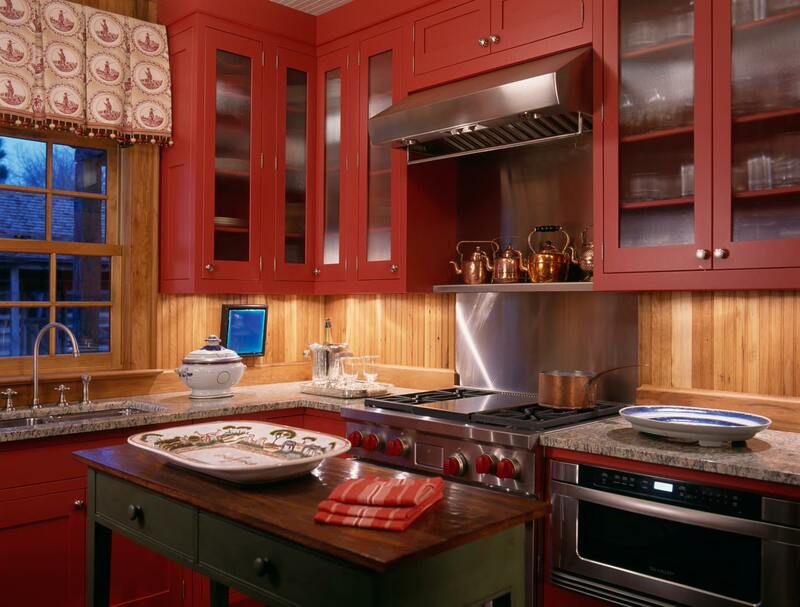 The kitchen in this lodge is the perfect mix of deep country red and natural wood tones. Just where you want to be, sipping hot chocolate on a snowy evening. Green, like blue, is a color many people gravitate to due to its calming properties. 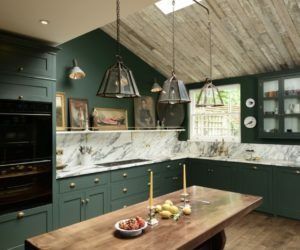 So if you are an experimental cook, painting your kitchen a lovely shade of green like this kitchen from can help you relax while you’re working out the perfect cake. 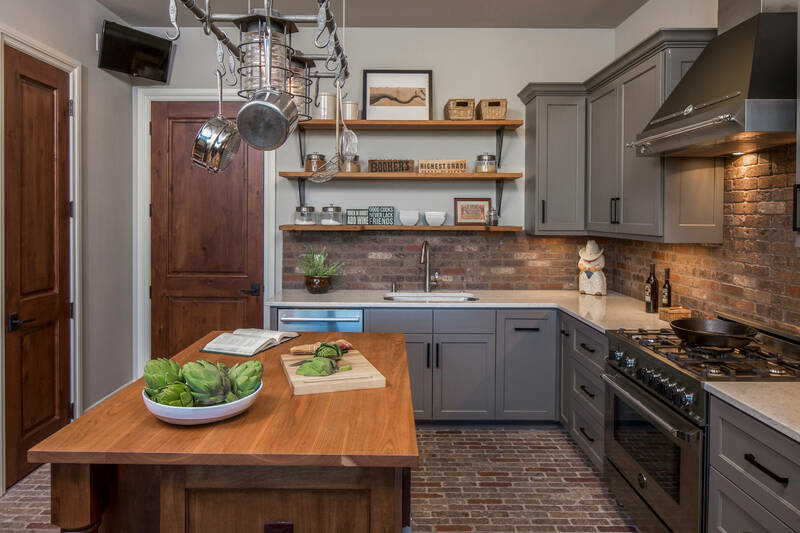 Rustic kitchens that contain a lot of natural textures like wood and stone can really benefit with a calming color to balance out the busyness. 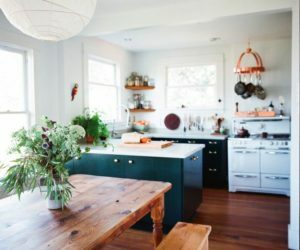 infused this kitchen with a pale leafy green by giving the wood cabinets a once over, but only a once over so the wood grain still peeks through. 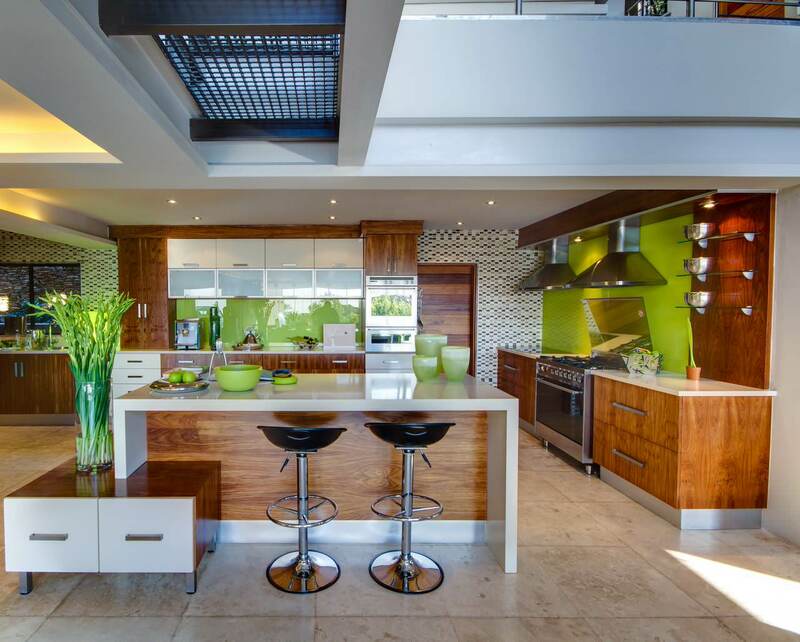 Green is also a great shade for modern kitchens. 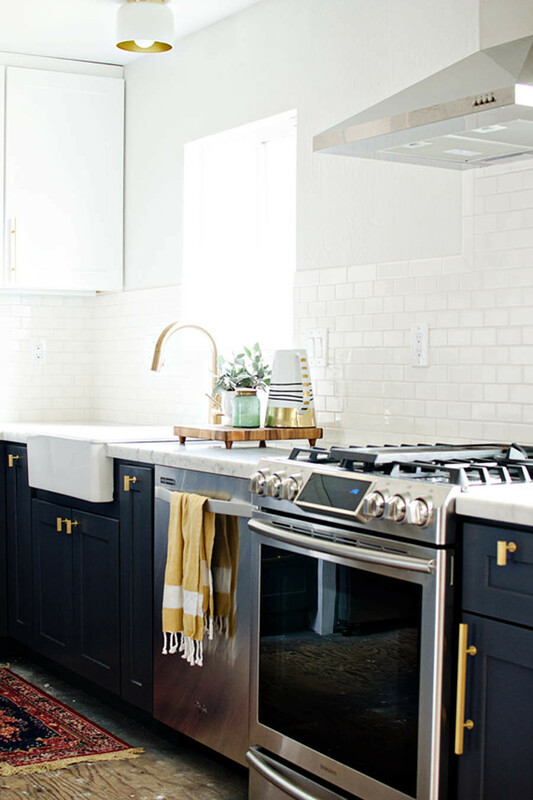 Just raise the brightness a bit to get more pop against your modern style and, like already knows, you’ll have the best kitchen on the block. You’ve probably already figured it out, but marble pairs so well with cooler colors. 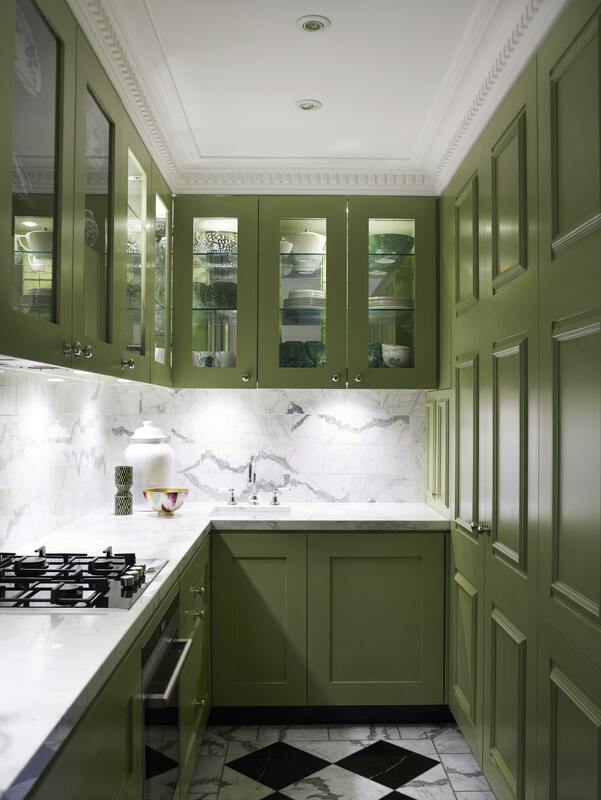 uses green for the cabinets in this marble covered kitchen which creates a very classic feel. Proof that green can solve so many problems. 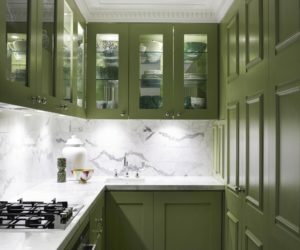 If you’re really serious about marble, you’ll be thrilled to see this green tinted countertops. found an unexpected way to put more green into this kitchen and still keep the clean white look. A win win for everyone involved. opted for a deeper green than you see in most kitchens. But the dusky hue totally complements the modern additions without losing the traditional feel. 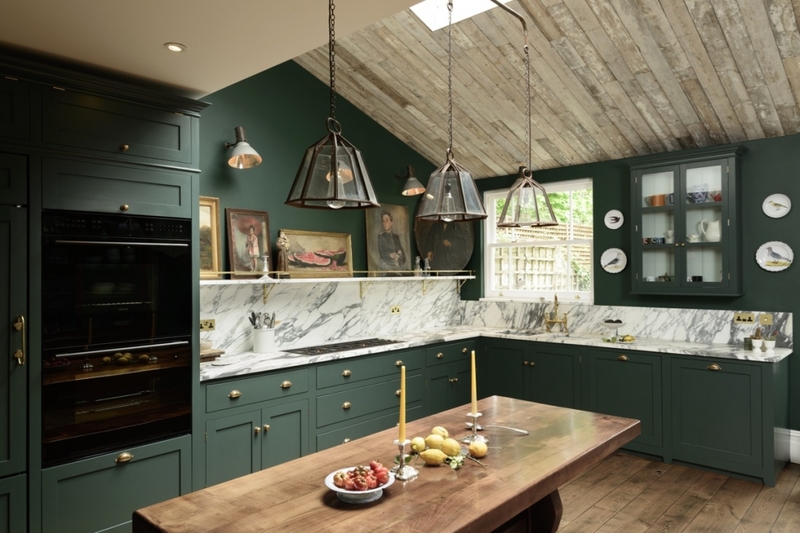 It’s the perfect shade for a kitchen in an older home. 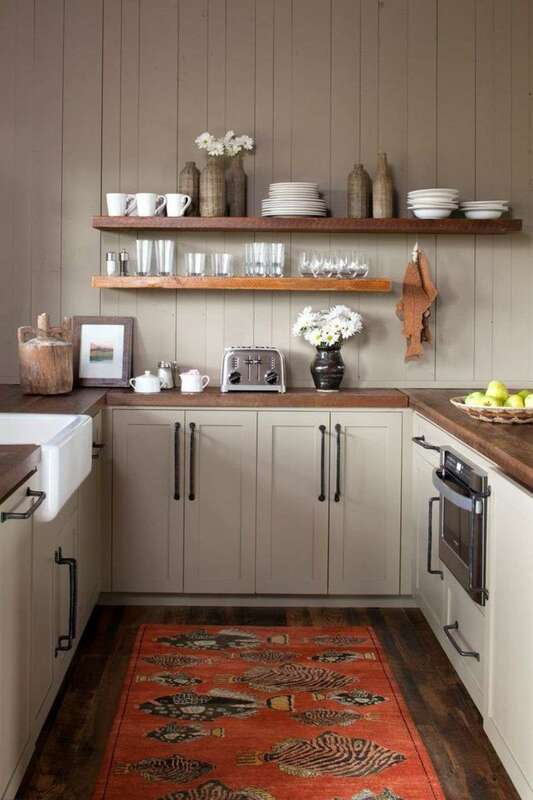 Farmhouse kitchens might be one of the most fun to decorate due to the simplicity and practicality of the space. covered everything in the same pale shade of green to create the image of continuity while still being the cutest kitchen ever. There’s nothing like a bright backsplash to stand out against your wooden cabinets. 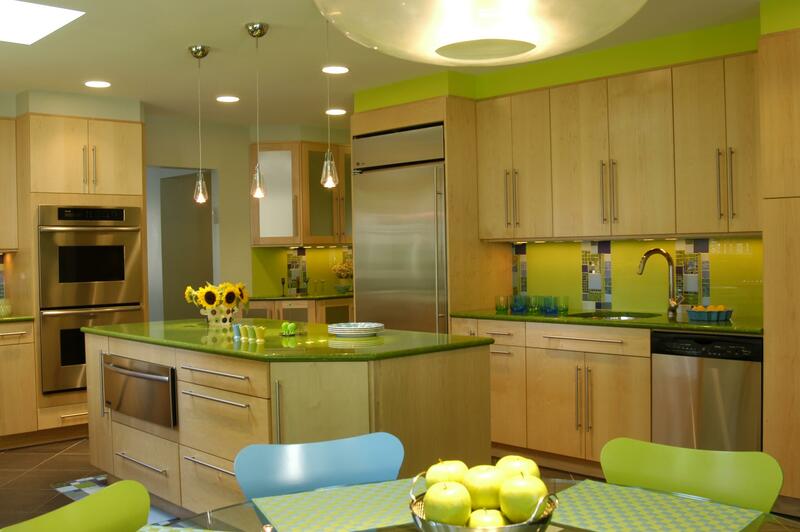 The bright green of this kitchen really stands out and makes the modern space seem more friendly. 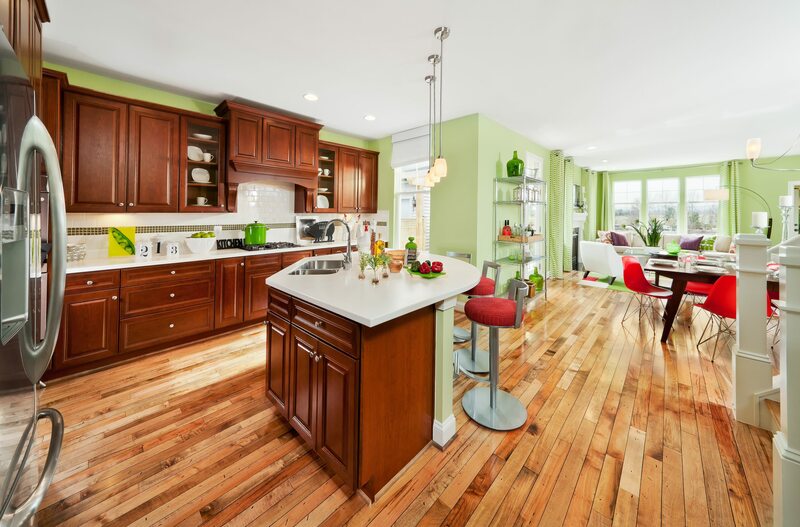 If walls, cabinets and backsplash weren’t enough, you can also put green on your kitchen floor. 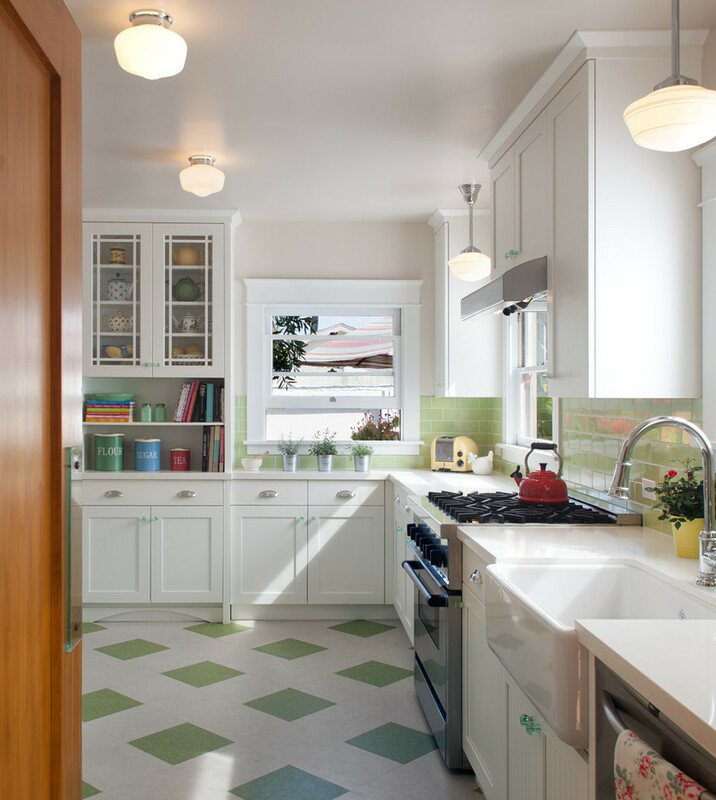 wisely uses green and white linoleum to keep the retro feel in this kitchen but the green creates less of a contrast than using black and white. 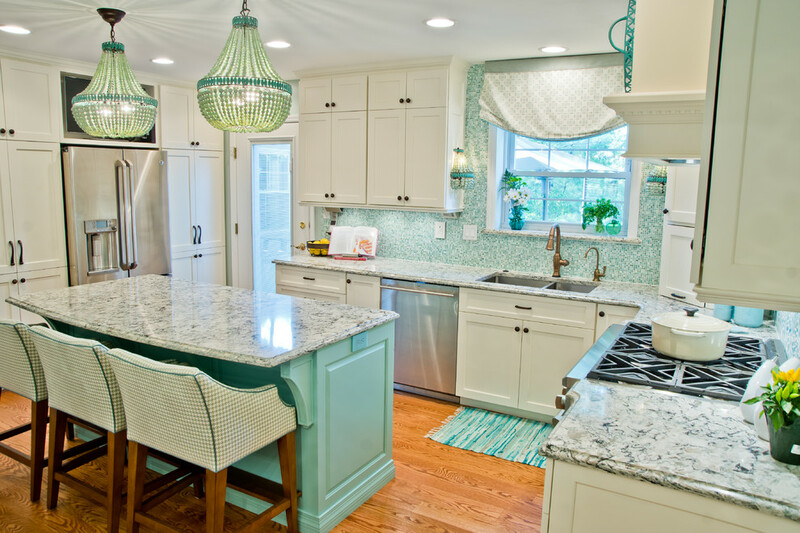 When all else fails in your little beach cottage, go for a sea green theme. 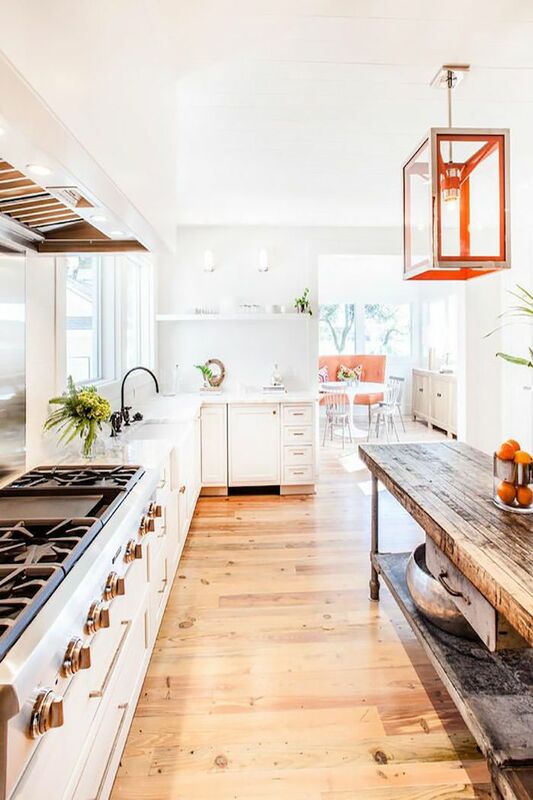 This kitchen is just the place you want to come into after a romp at the beach. When you hear the word chic, most likely you think of something the color of black. 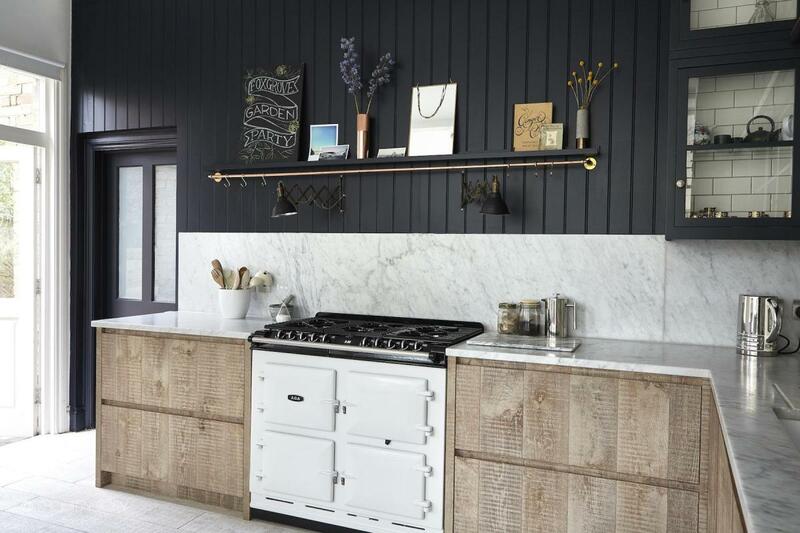 So when we say that black kitchens are the chicest you can get, you probably have no trouble believing us. 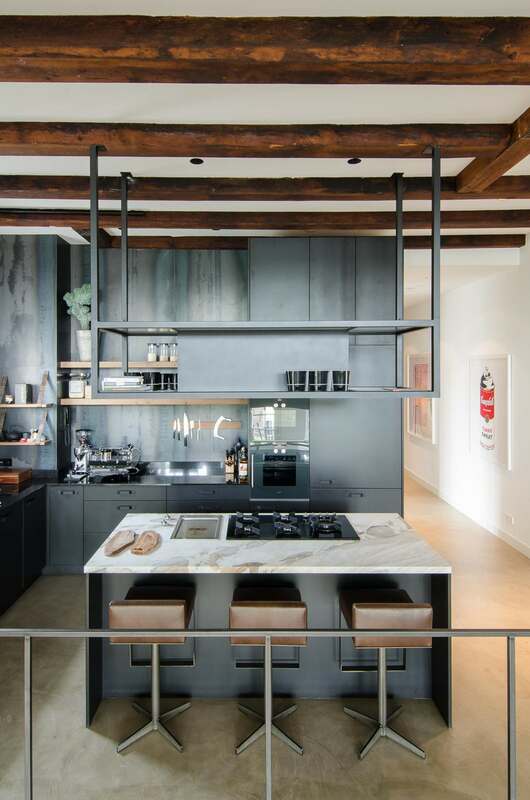 This black kitchen by creates a space that feels close and cozy. Black and marble? You betcha. takes a dusty black and covers the beadboard of this kitchen with it. With those marble countertops and backsplash, you can have date night in a kitchen like this no problem. Now that embraces all the black. Not only did they paint their walls in the blackest shade they could find, they also swathed the cabinets in it. 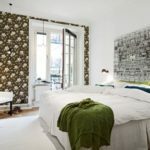 It creates the perfect space to host cocktails on summer evenings and nurse hangovers the next morning. 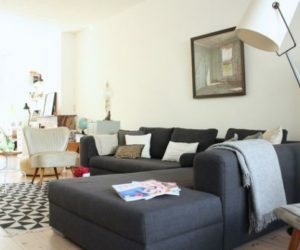 Opting for a black floor instead of black walls will definitely help ground your space. In they even installed black cabinets and appliances. When you’re wanting to make a statement, this is how to do it. 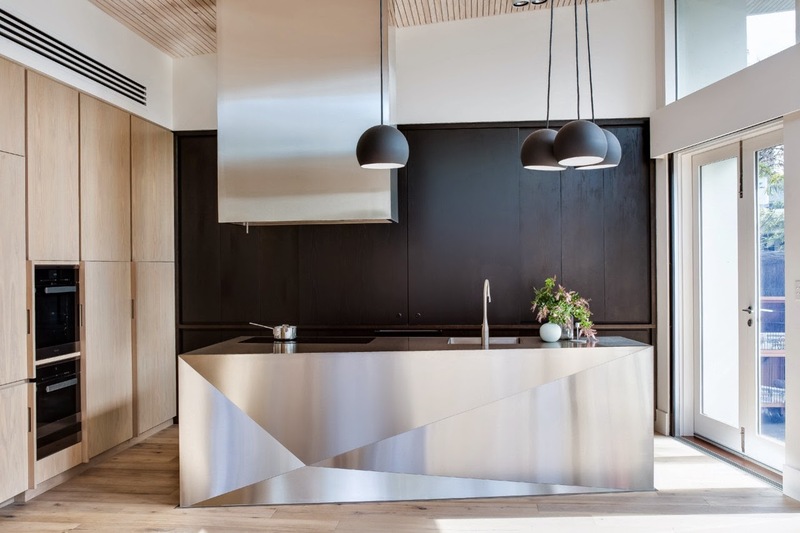 So many modern kitchens are styled in white and stainless steel for a clean cut effect. 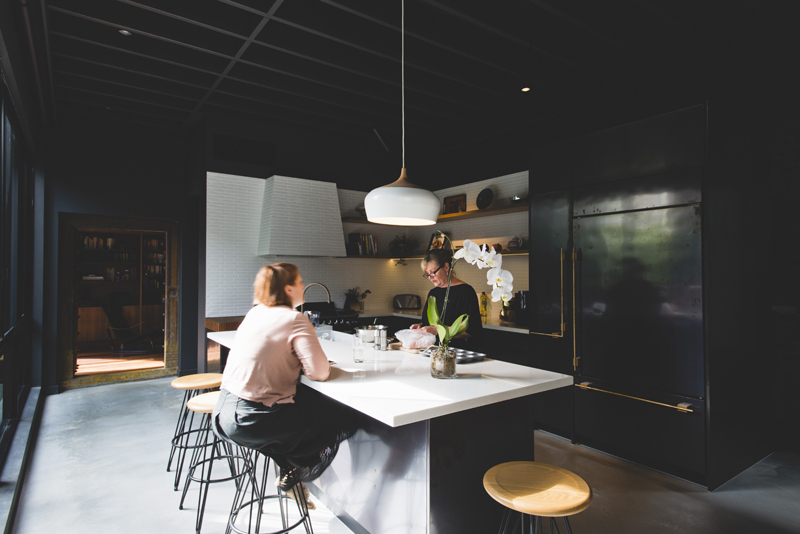 But what if you used black to make your kitchen stand out from the rest of your home, like this one by ? You would definitely bring a new level to your modern styling ideas. 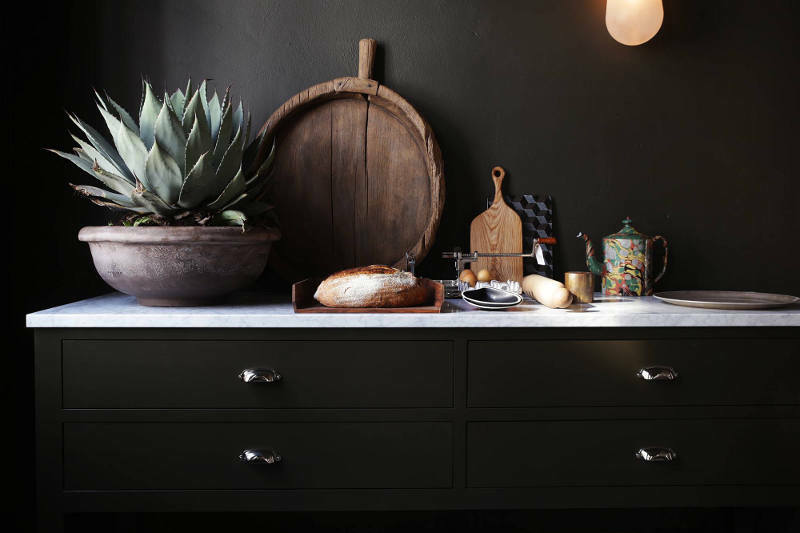 Even rustic kitchens can boast black in some pretty spectacular ways. 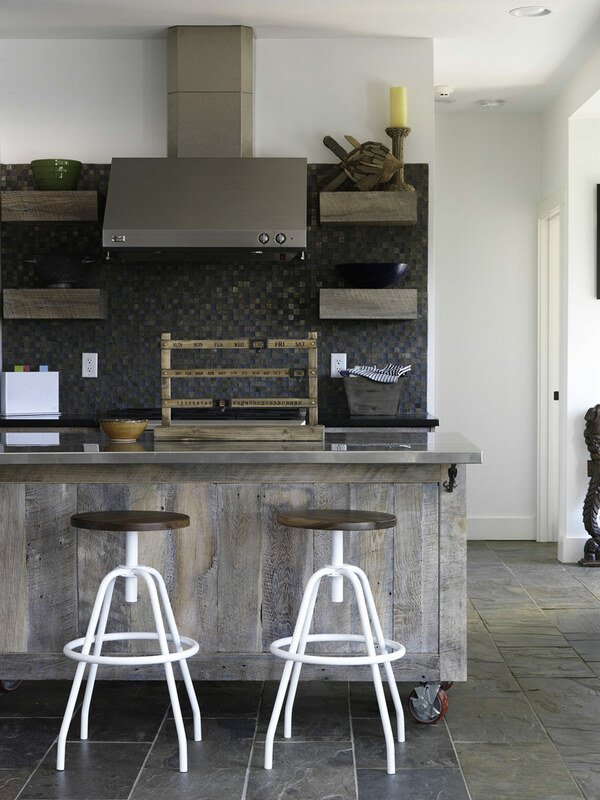 embraces the shade in lieu of backsplash in this rustic space. Next to the wood, it brings a bit of industrial style to the table. While most people resort to white to show off a popping color, maybe you should consider black instead. 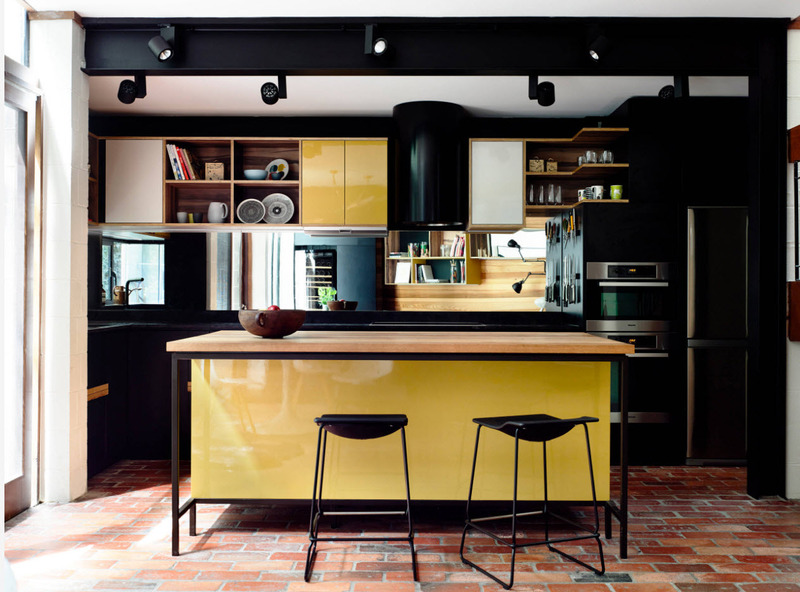 Especially if you have a bright shade like the yellow in this kitchen, black can really give your favorite color the punch in needs. 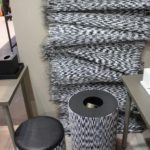 Oh it’s blackest black, but those tiles have a wavy surface that make the black seem more approachable. uses them to make a statement among the glowing white cabinetry. We just can’t put down the black backsplash yet. 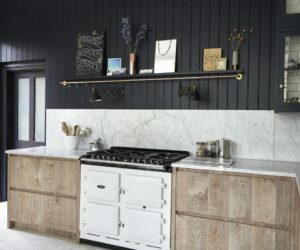 In a rustic kitchen that needs a inky statement, you don’t really want the smooth black subway tile. So had the right idea when she chose a black backsplash with all that texture. definitely puts together kitchens that are anything but standard. 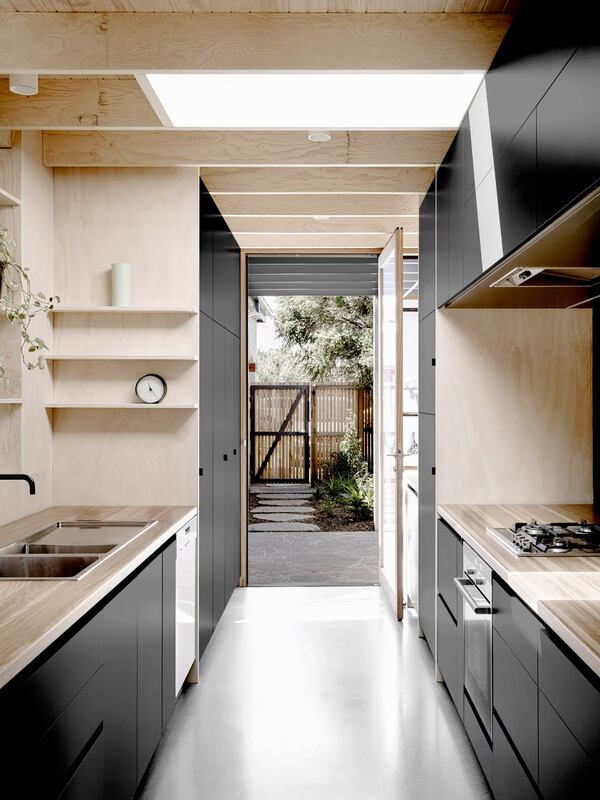 All the sleek black cabinetry gives off the most modern vibes with just a touch of industrial charm. Perfect for the homeowner who’s looking for contemporary and natural at the same time. There is a slight problem for certain homeowners. 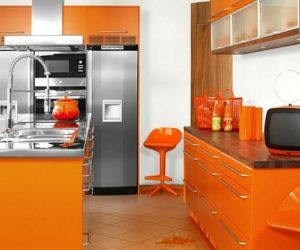 When your favorite color is orange, it seems rather discouraged to decorate with it. 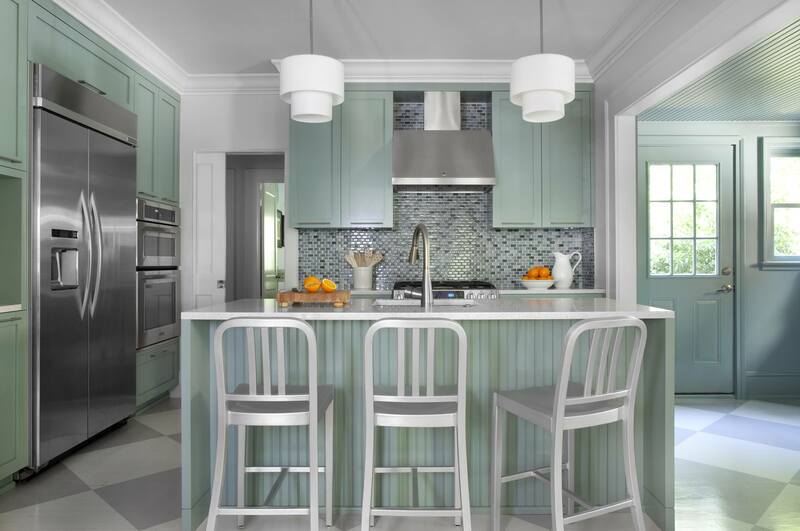 However, the kitchen can be the perfect place to infuse with such a happy color, like this beauty with sleek cabinets from Applegate Interior Design Project. 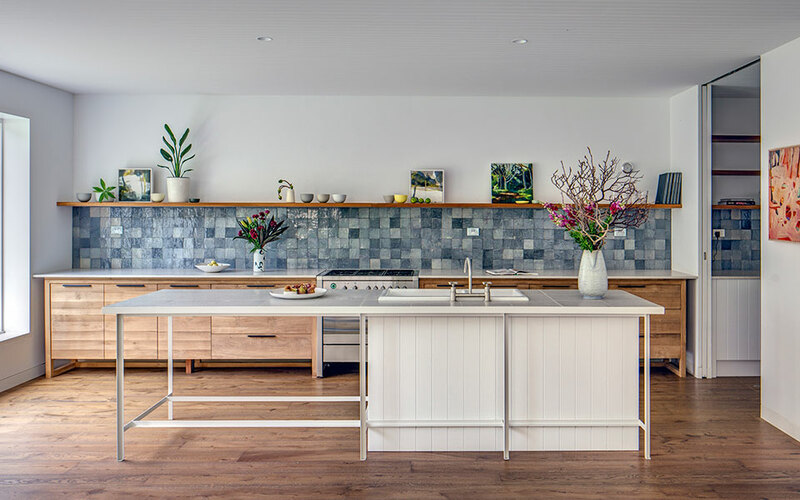 This kitchen by is proof that you can get tile in any color you like. 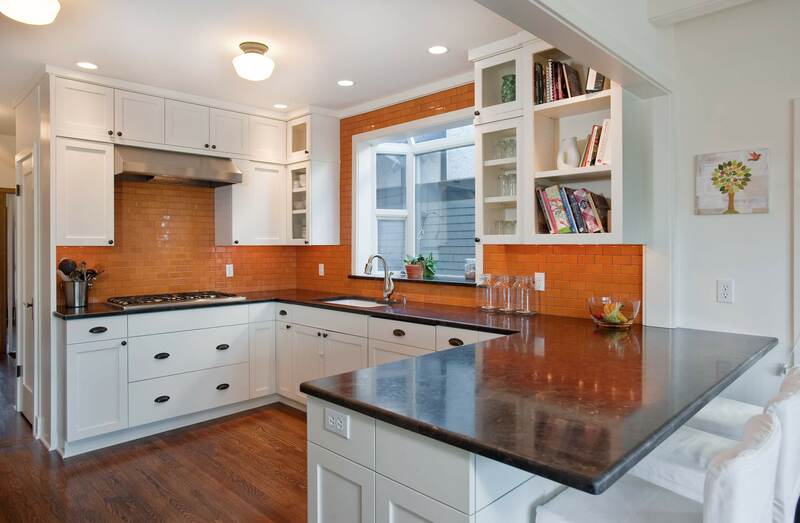 The orange here is not too bright to be glaring against the white cabinets but not too dark as to look like bricks either. On the flip side, when your cabinets are a darker shade like these wood ones, you can get away with the brightest shade you can find. 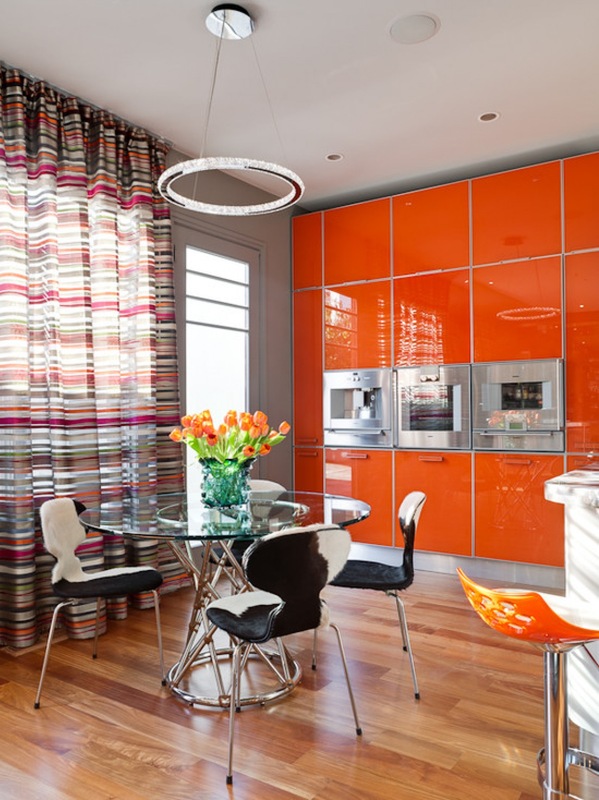 The popping orange of makes the whole space feel bright and modern, a place to make you smile first thing in the morning. 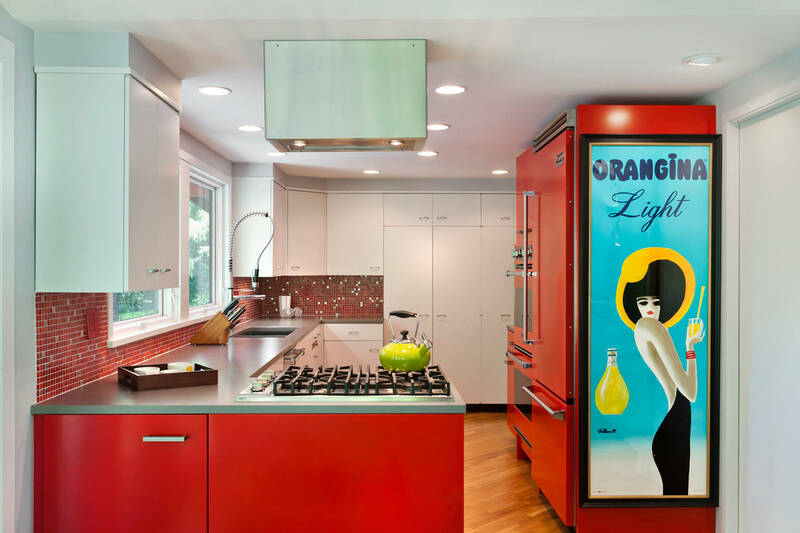 Orange is the reigning color of midcentury modern decor. But instead of covering the walls with it, opted for orange countertops instead. We still get the midcentury modern feel but we aren’t accosted by orange either. 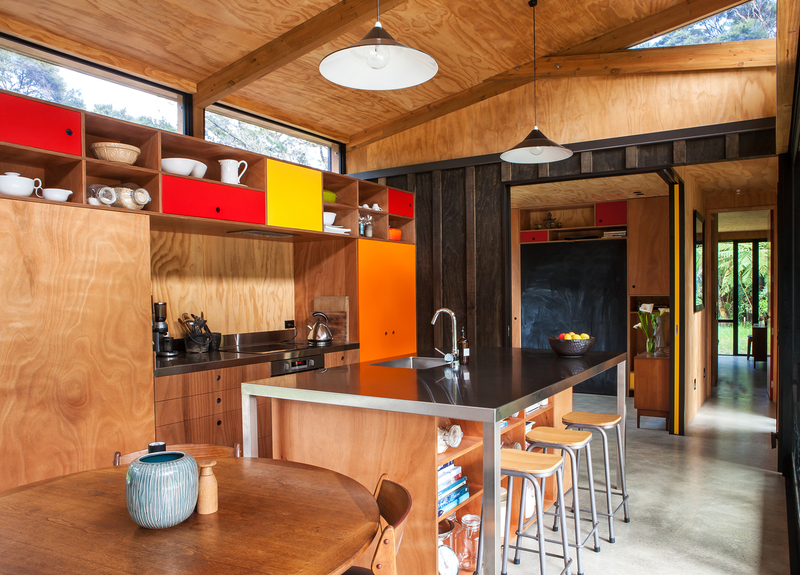 Orange doesn’t have to feel midcentury modern. It can definitely be just plain ol’ modern, like in . 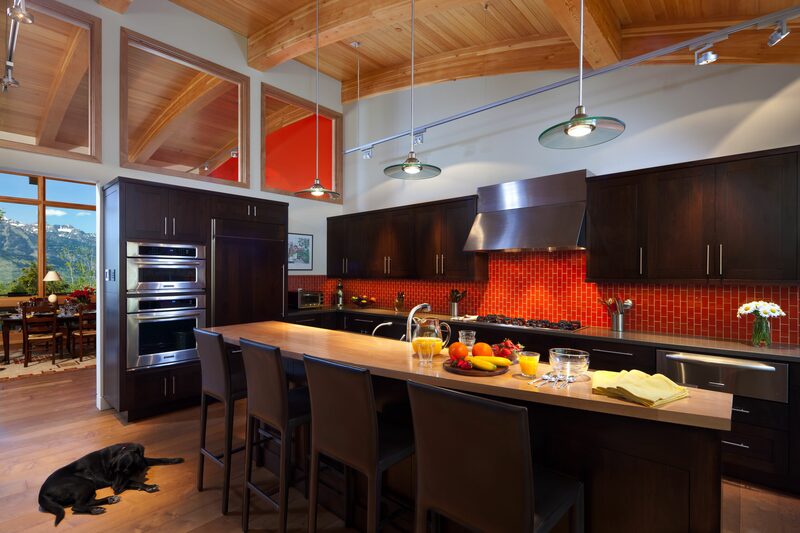 The reddish orange paired with wood cabinets feels warm and welcoming for all your entertaining needs. 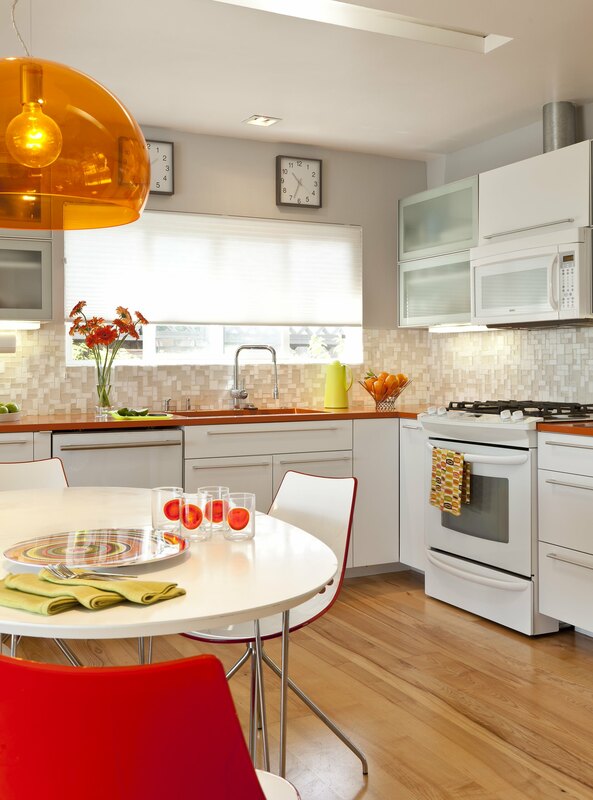 Backsplash isn’t the only way to put orange in your kitchen. 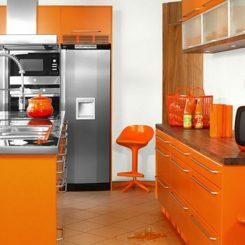 Orange cabinets like these in this kitchen can be a great way to use your favorite shade in a space you inhabit for many hours in a week. For the diehard orange enthusiasts, did you know that they make orange appliances? 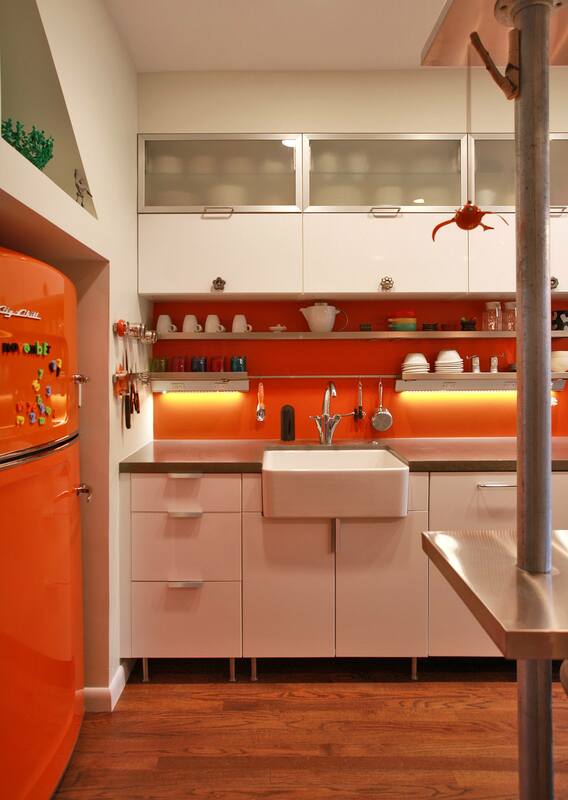 did and they utilized that resource to find a fridge that perfectly matches the orange backsplash in this tiny kitchen. With a bit of orange paint, you probably can’t go wrong. 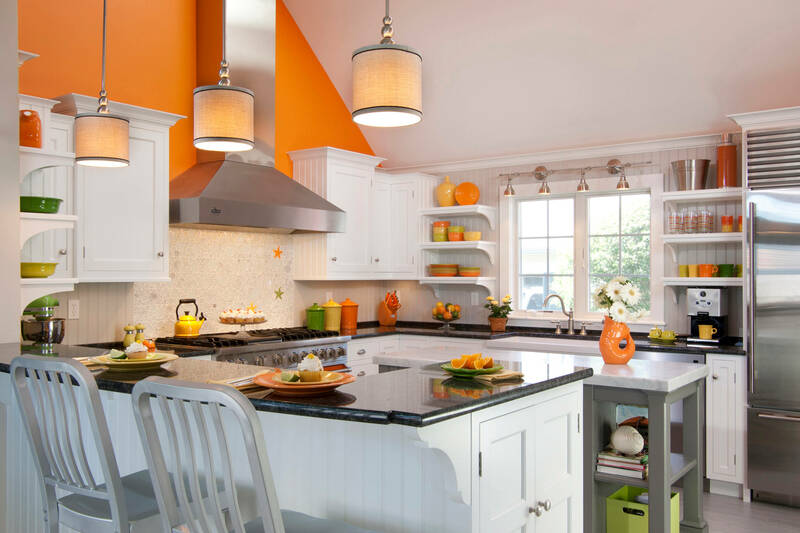 By giving your kitchen an orange focal wall like this kitchen, you can easily imagine it’s summertime all year round in your bright happy space. Isn’t that tile just glorious? 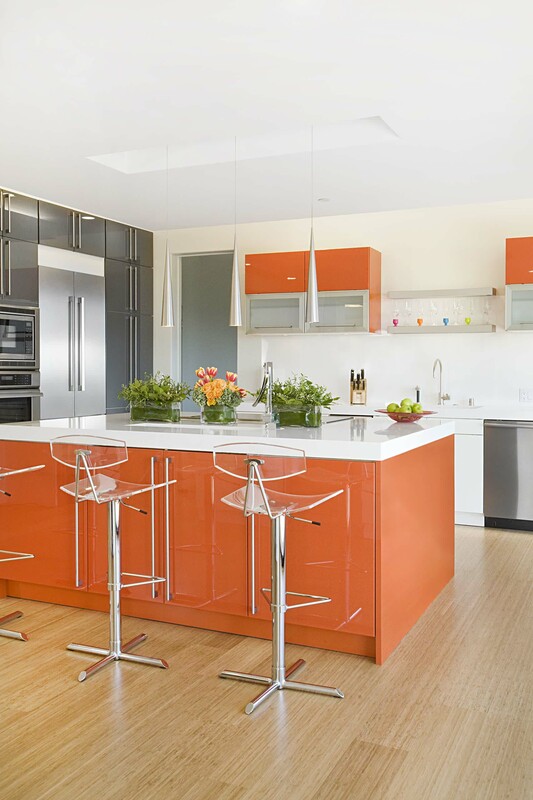 The orange design chosen by for this kitchen goes perfectly with the rest of the pastel shades in the home. It’s a great example of how orange really can match with anything. Copper has been the in metal for a long time. 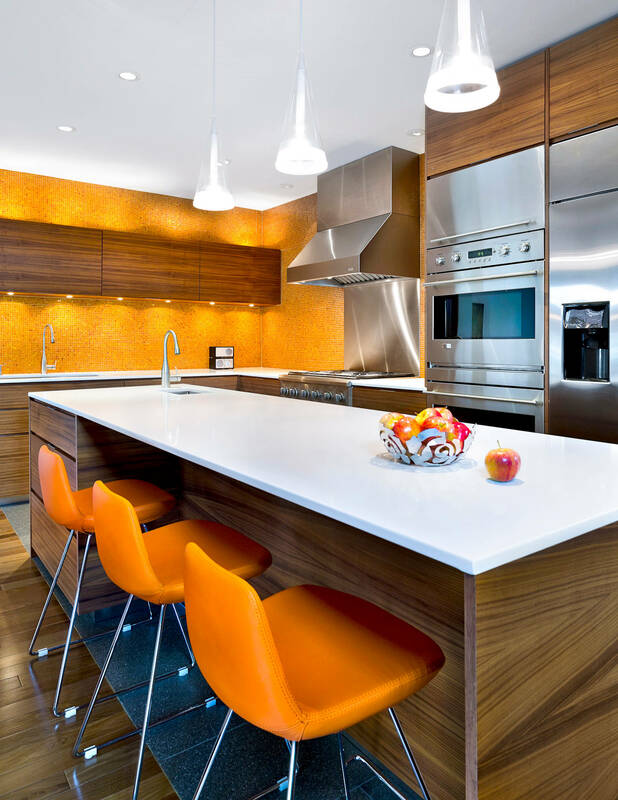 Lucky for you orange people, it can give off an orange glow in your kitchen. 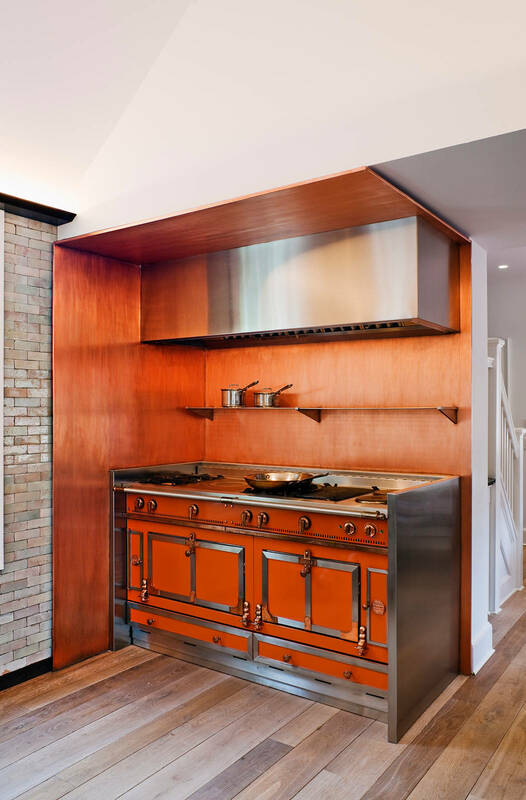 Get stylish with this idea from and use copper as your backsplash. 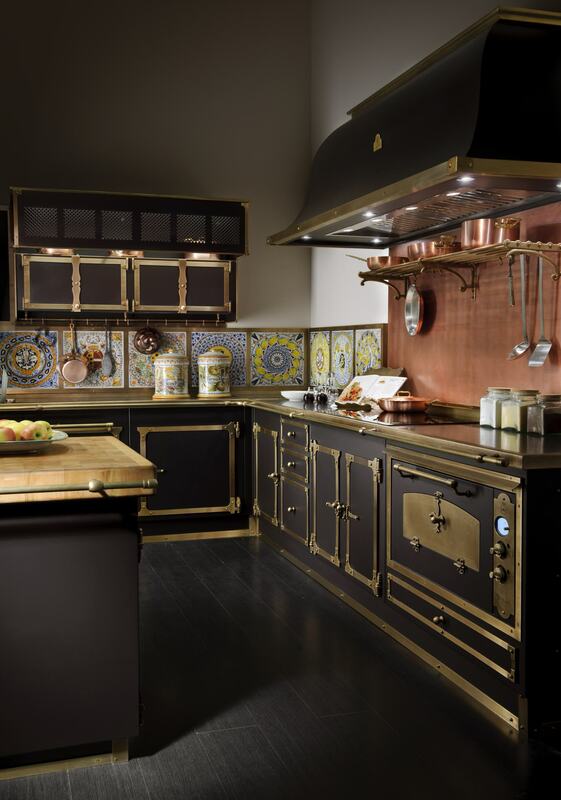 No need to decorate the rest of your kitchen because the copper alone will take your breath away. Yes, beige is gone and done. 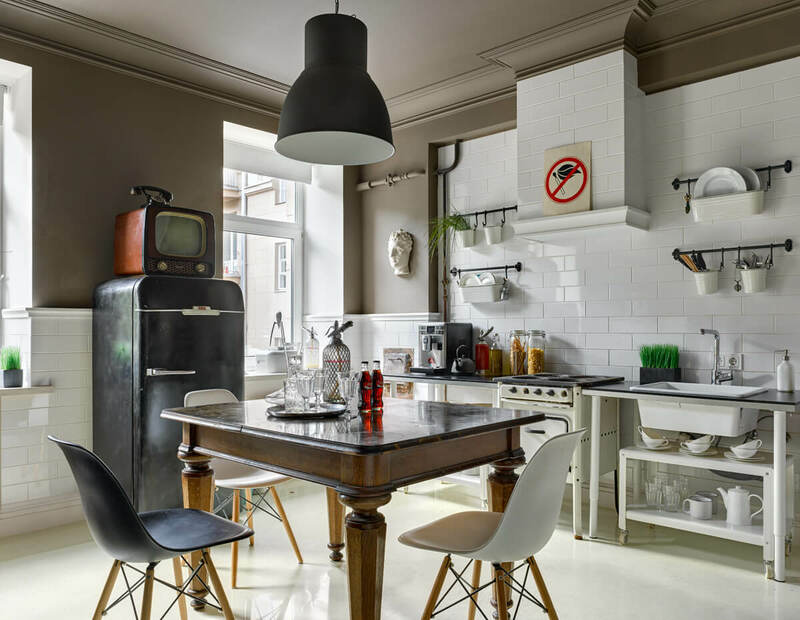 But if you’re not quite ready to let it go, consider a gray tinted brown for your kitchen. 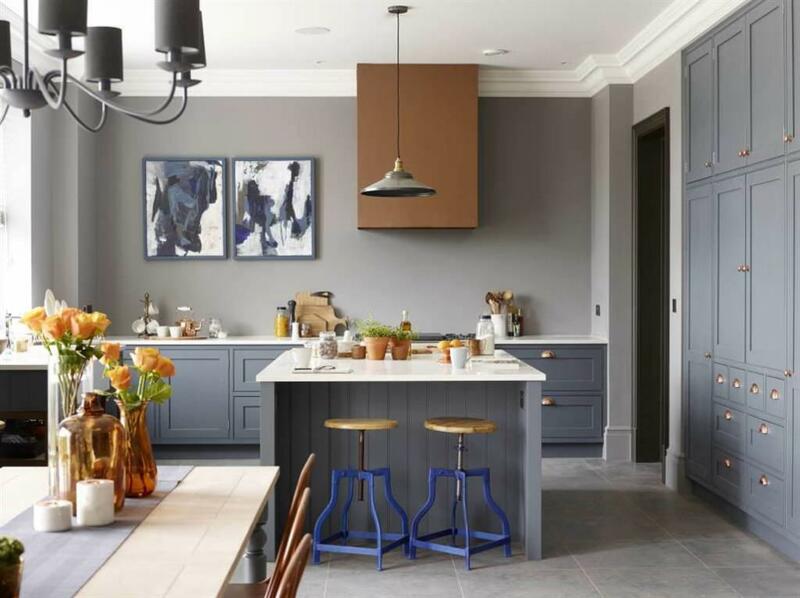 Greige is a beautiful soft shade that will seemingly wrap you in a hug while you cook for your family, exactly like this kitchen by . 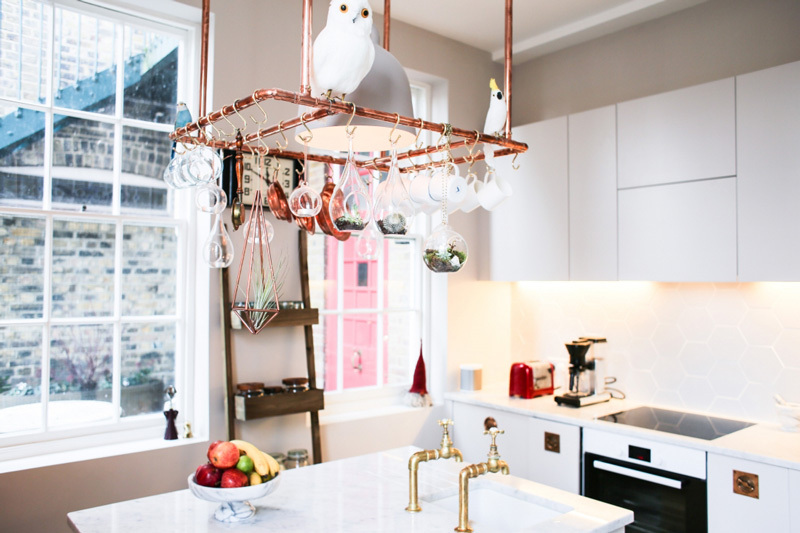 If you look hard enough, you’ll noticed that this kitchen is basically a work of art. 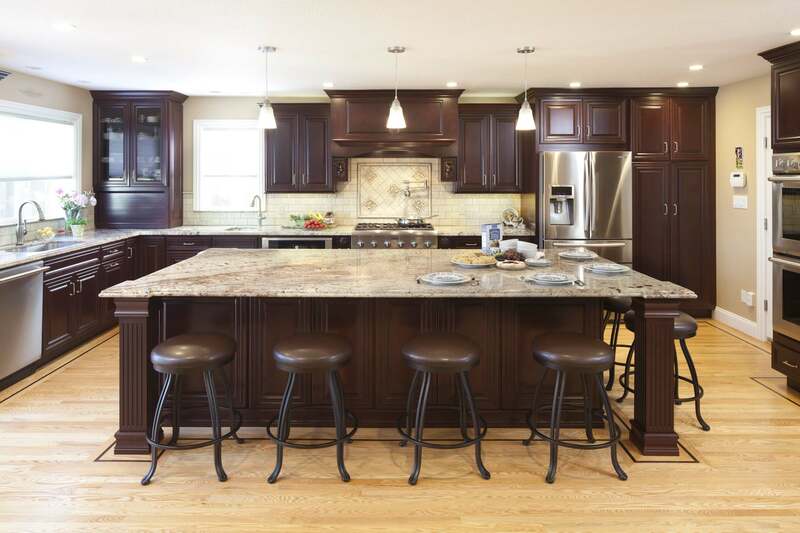 Put white cabinet doors on dark brown cabinets for a spectacular contrast against against all that chocolatey brown. 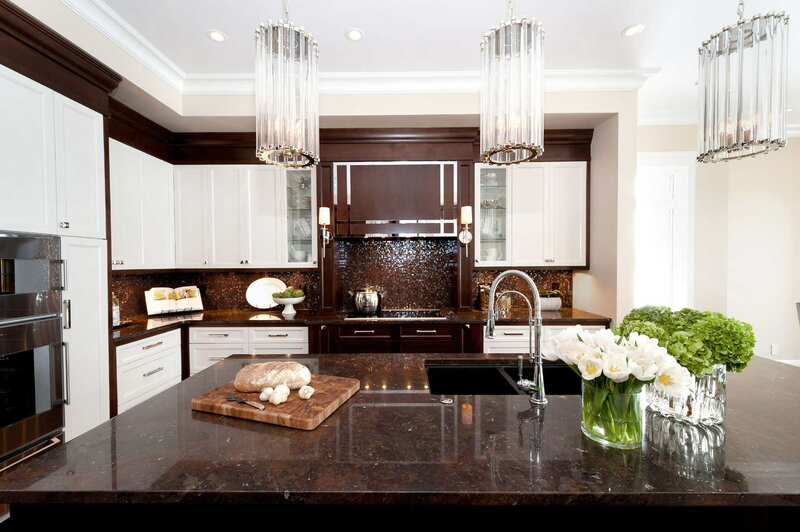 utilizes brown in several different shades in this lovely traditional kitchen. 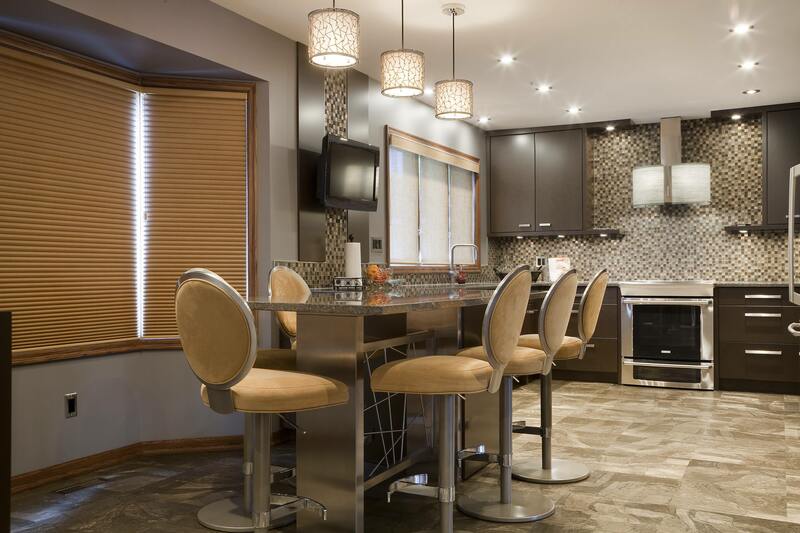 The light brown backsplash complements the cream cabinetry while the deep brown island table really stands out. And then there’s the wood floor underneath to bring it all together. 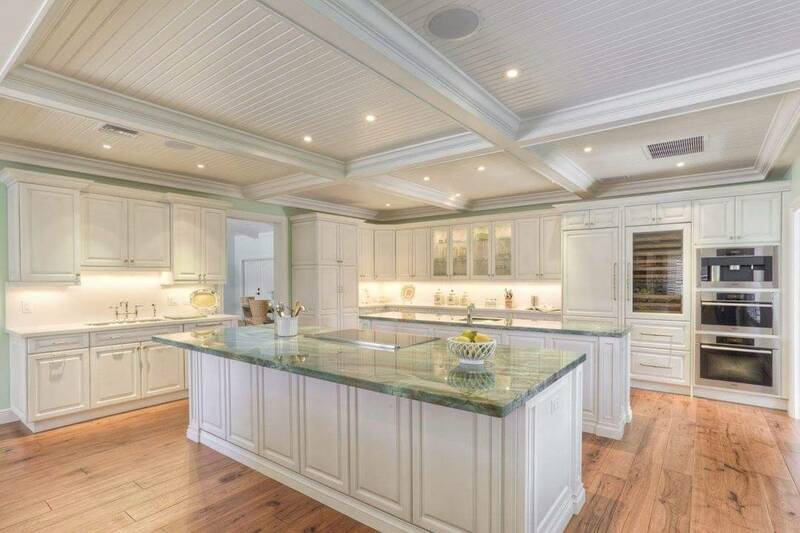 Some people don’t have the money to completely revamp their currently beige kitchen. 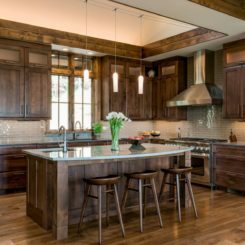 So take advantage of the light brown and install dark brown cabinets to give yourself a break from beige, like in this kitchen. Of course you aren’t stuck with only light browns and dark cabinets for brown options in your kitchen. Feel free to follow ‘s design and paint your walls a darker shade of brown to stand out against your white tile. We just have to revisit the brown backsplash concept for a second because this kitchen is on point. chose a tile backsplash that includes probably five different shades of brown to really pull together all the other shades in the room. Modern kitchens require creative kitchen layout designs to help you keep a warm and homey feeling without losing the contemporary beauty. 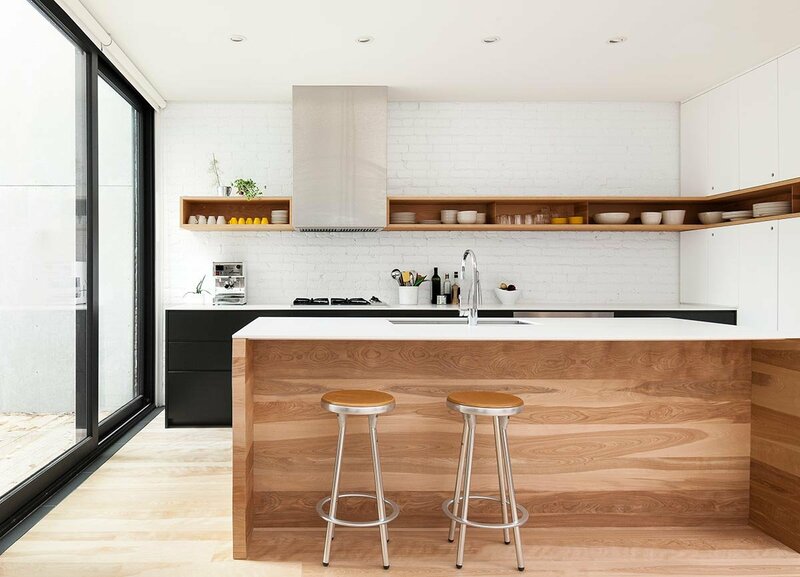 This kitchen by utilizes plywood to bring that textured brown into the space but keep things light and airy. Rustic kitchens might be the best examples for brown kitchens. 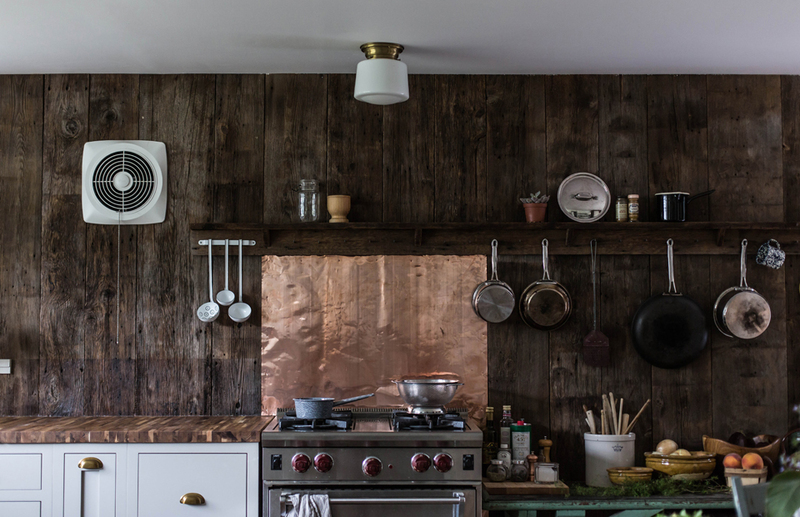 covered these kitchen walls in rustic wood for a quaint and cabin feel. The variating brown shades and all that wood grain really gives this place a family friendly vibe. Talk about cabin vibes. 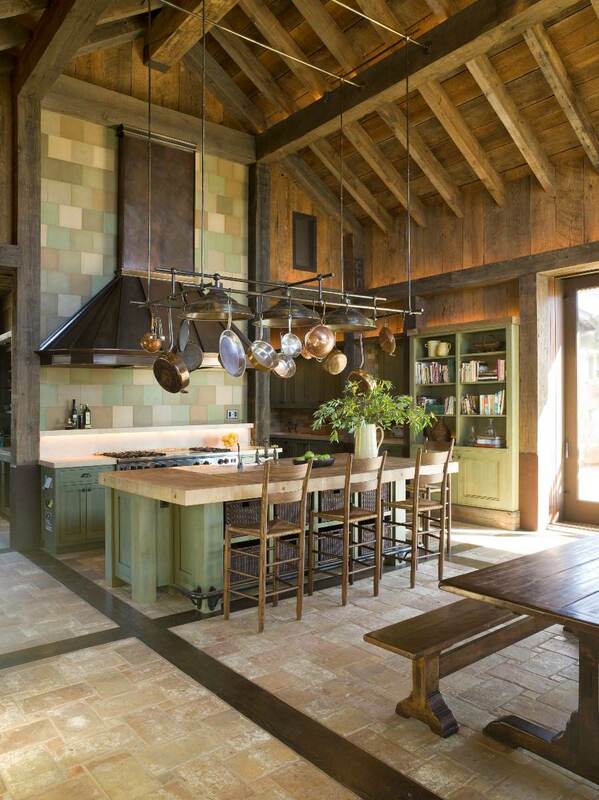 This kitchen by took basically a whole barn’s worth of rustic wood to put in the kitchen. It’s such a unique warm look that’s perfect for a little house in the woods. 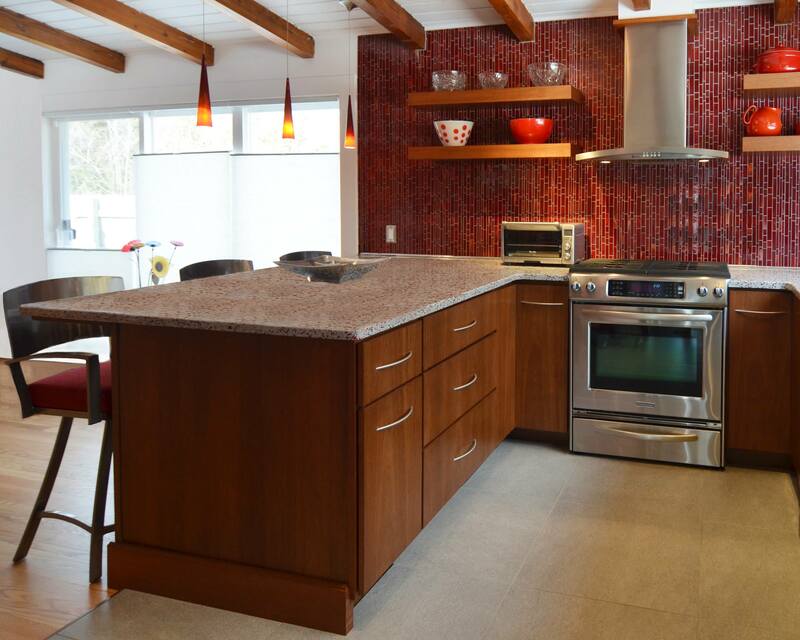 This kitchen has a very midcentury modern feel to it. 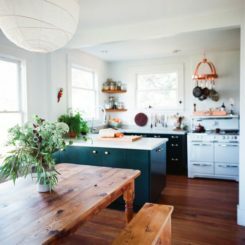 The perfect shade of wood against those bright cabinet fronts would encourage anyone to spend a little more time cooking for family instead of eating out. 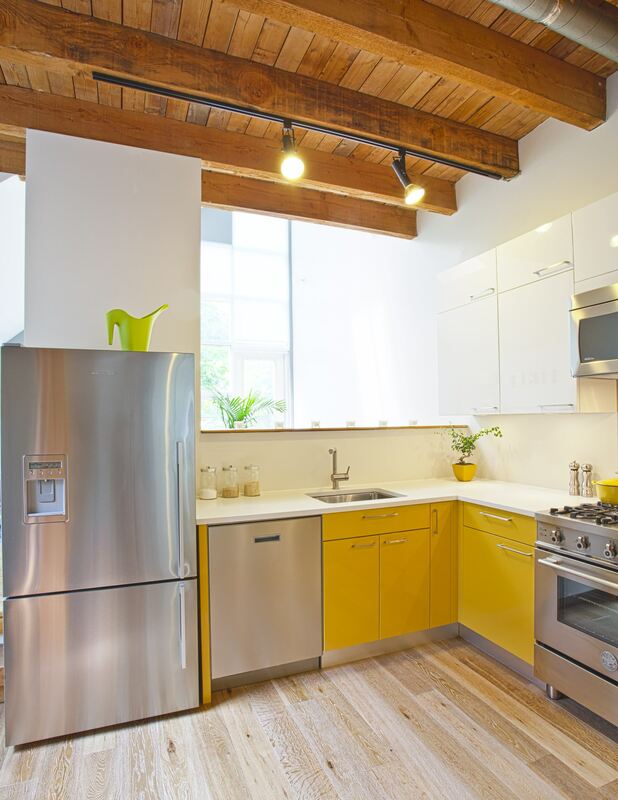 Yellow kitchens just belong in happy houses, like this kitchen from . That butter yellow is the perfect shade tone to drink your coffee to every morning. 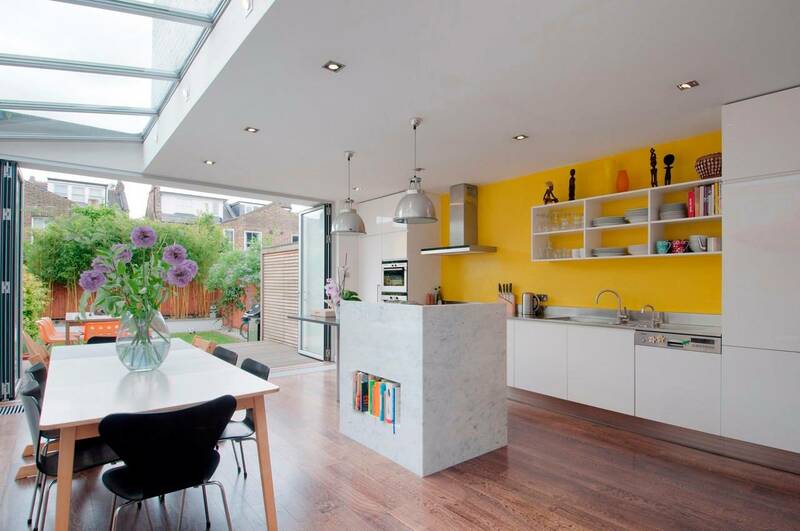 proves that yellow can work even in the contemporary kitchens. 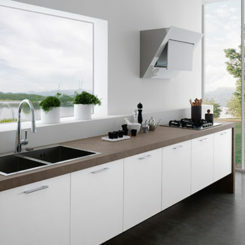 It’s a color that will seamlessly combine the sleek lines of modern design with the traditional look of an older home. 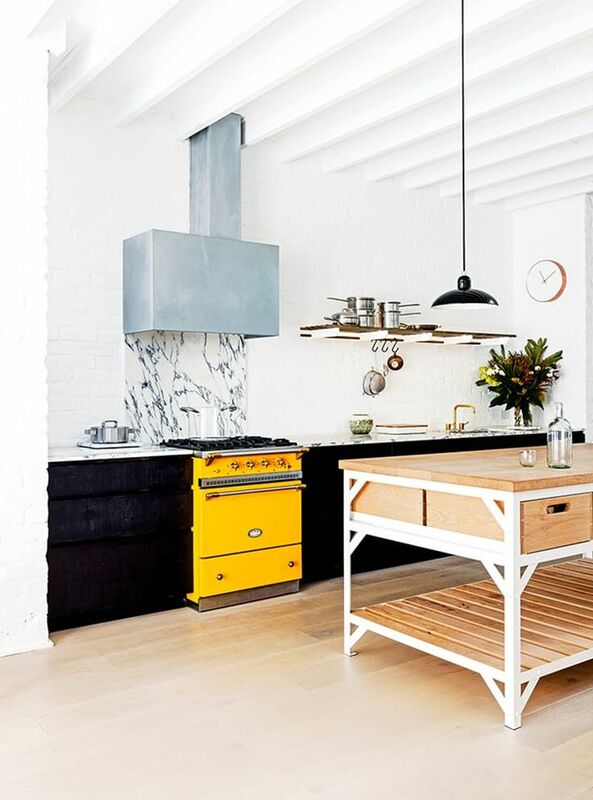 Think outside the box when you’re putting yellow in your kitchen like . Instead of painting the walls, they painted the cabinets so they could add a nice clean subway tile backsplash. Now that’s thinking. Or… just find yourself a pretty yellow tile pattern to serve as your backsplash and all your food pictures on social media will include a dose of yellow. 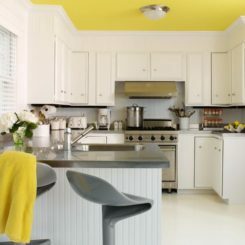 In this Adrienne DeRosa kitchen, there is two shades of yellow to bring some happiness to the eyes as well as the soul. 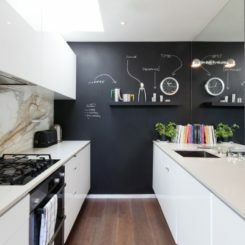 Kitchens might be the best places to take advantage of the statement wall, probably because there isn’t much wall to begin with. 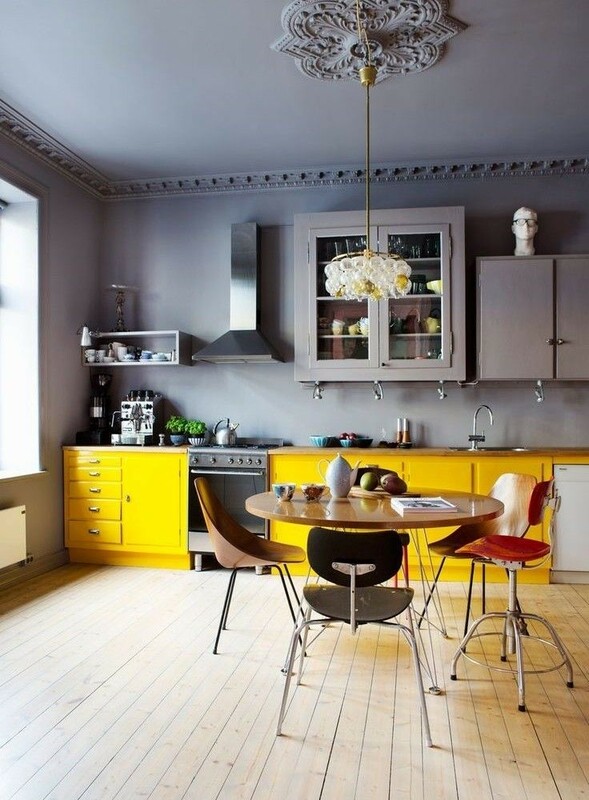 Go for a brighter shade of yellow like this kitchen and you’ll never be short of smiles while you cook. 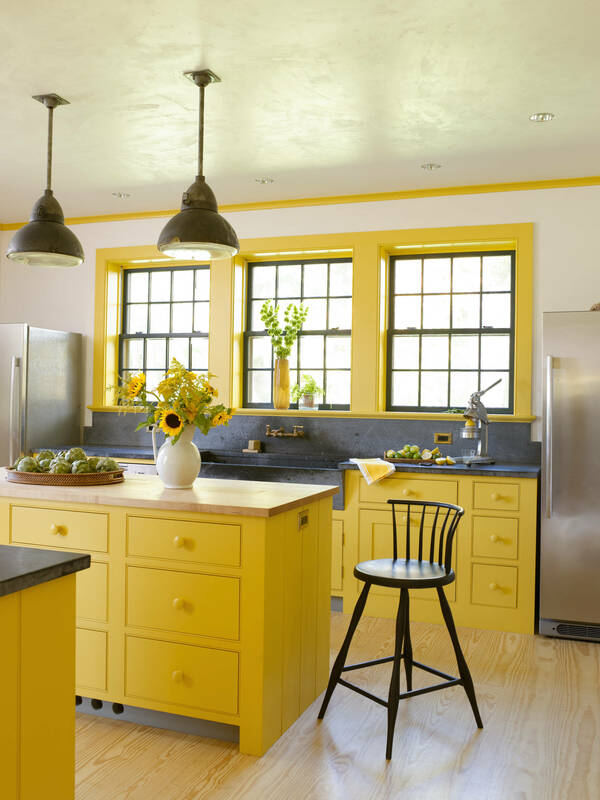 If you aren’t a shy decorator, follow the lead of this contemporary kitchen and find the brightest yellow you can muster for your main kitchen color. This works especially for small kitchens that occupy a little corner of the house. Retro doesn’t have to mean red. 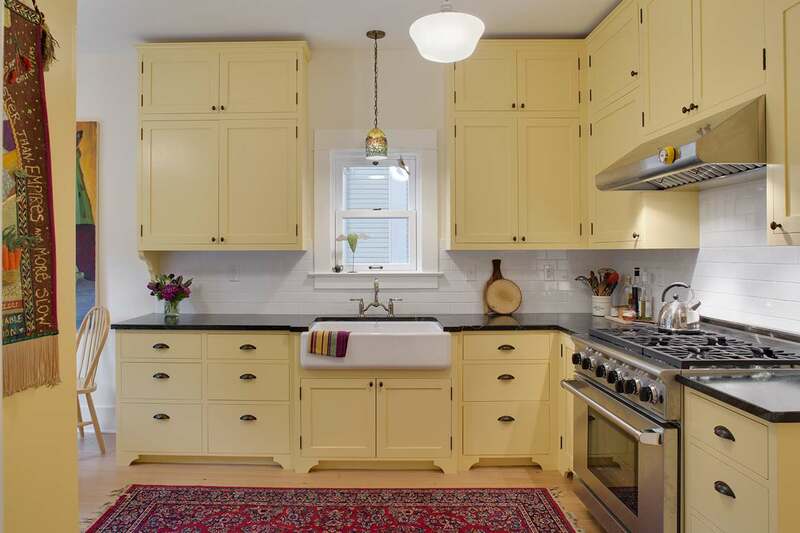 In this retro kitchen, designed by , butter yellow swaths the walls, backsplash, countertop and floor. 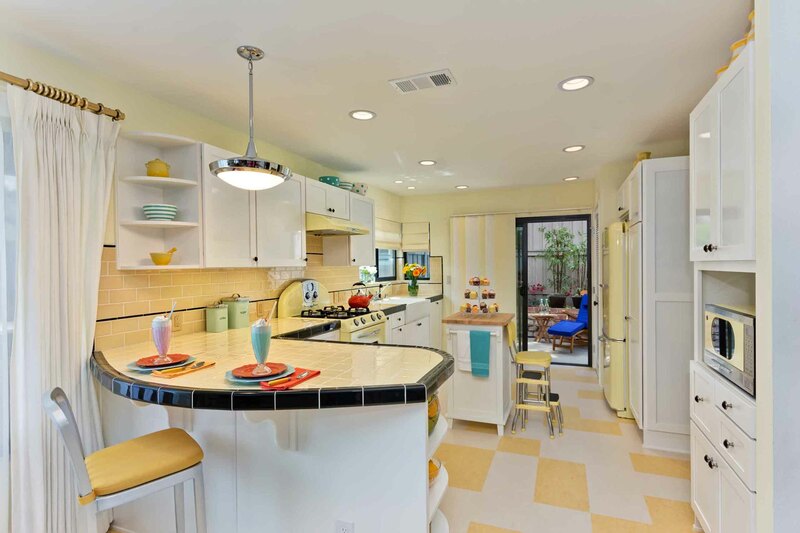 They even found pale yellow appliances to match, the real retro way. Wanting to give your classic old home a contemporary lift? Yellow is the way to go. used a bright sunny shade to cover the cabinets and trim of this farmhouse to bring a real family friendly flair to the space. 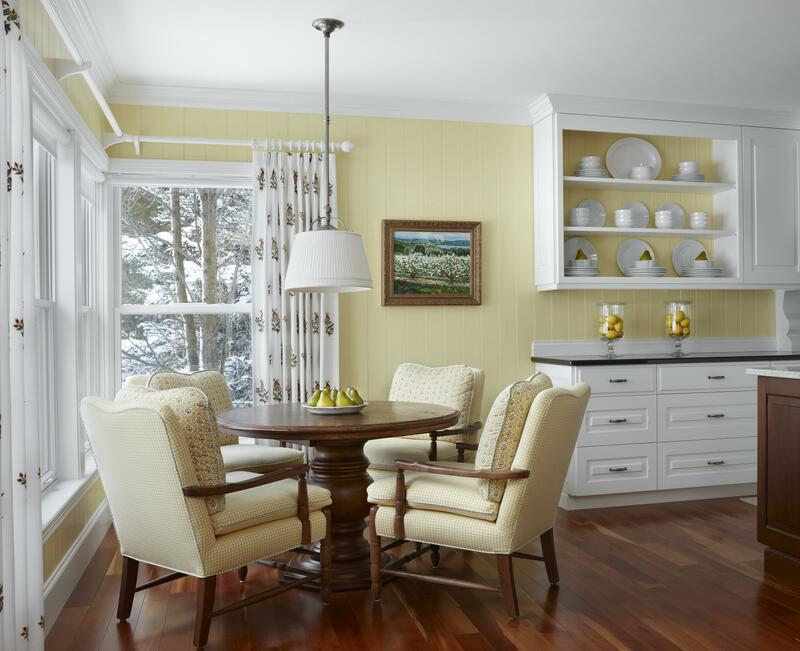 took a kitchen and breakfast nook and brought them together with pale yellow cabinets. Against that marble countertop, it feels so classic and traditional, like it was always meant to be that way. When simplicity is your friend, you can get away with a lot of different colors. 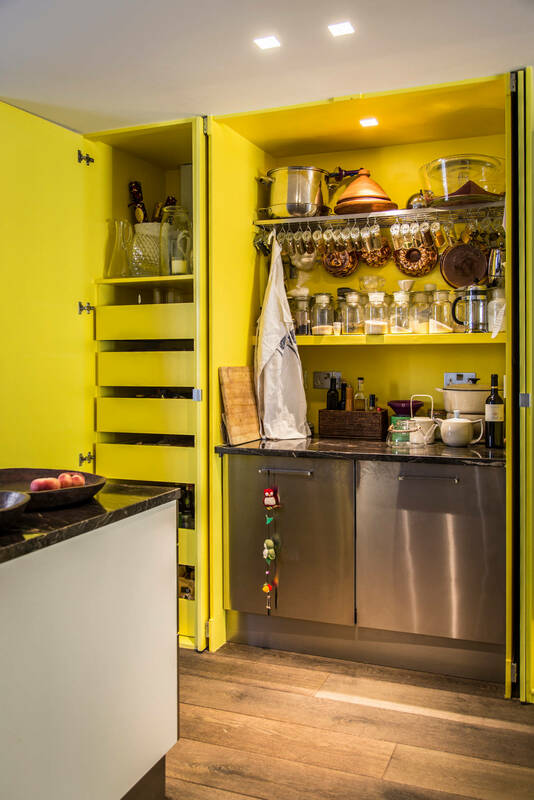 In this case, honey yellow cabinets are perfection because they only span the bottom of the kitchen. 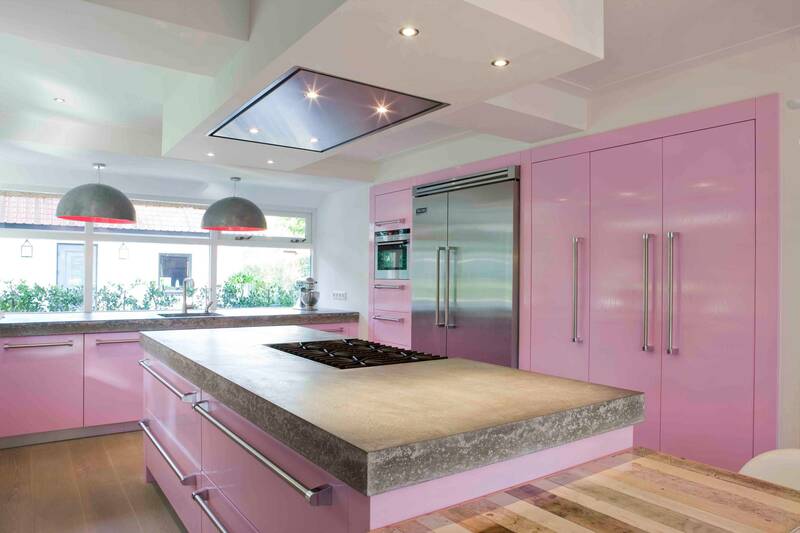 Pink has been a trendy color for the past year or two, so it makes sense that there are pink kitchens to be found! This beauty by is extremely girly with it’s striped cushions and floral shade. 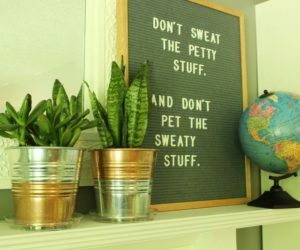 Just right for a bachelorette’s apartment. 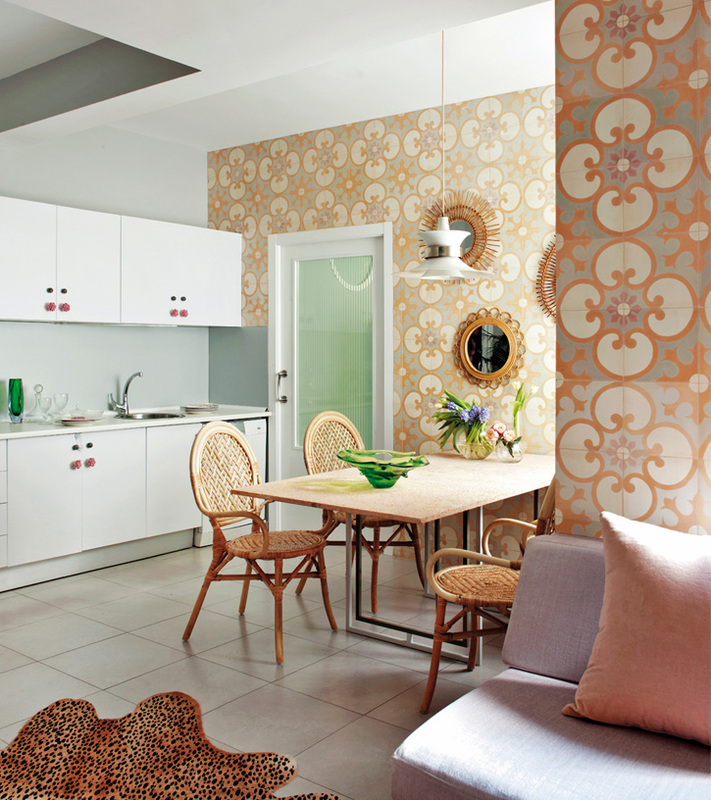 Remember what we said about kitchen statement walls? Pink is another great color for that. 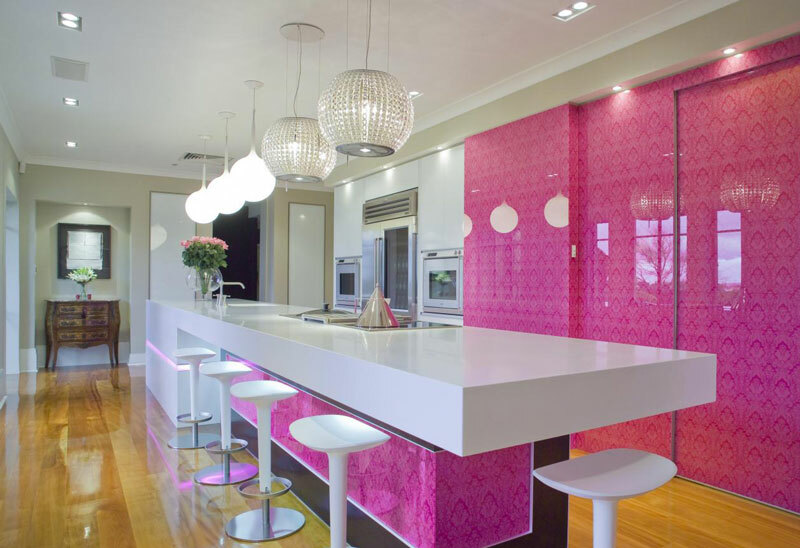 that utilizes clear panels for the illusion of pink backsplash when it’s really the wall behind them. 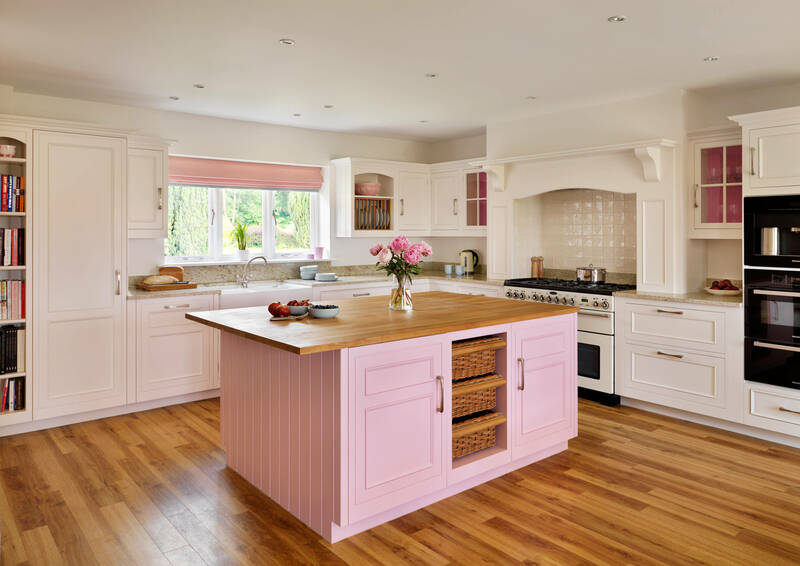 If you can get away with pink walls, why not pink cabinets instead? 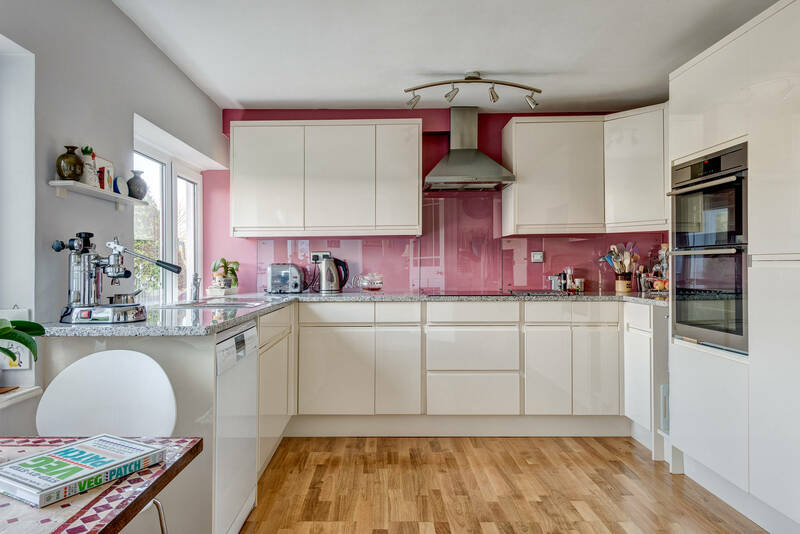 The glossy finish on the pink cabinets in this kitchen take the feeling from baby nursery to modern chic. Speaking of baby nursery, if you’re afraid that pink will make your kitchen look too much like a nursery, you can always tone it down to a lovely blush. 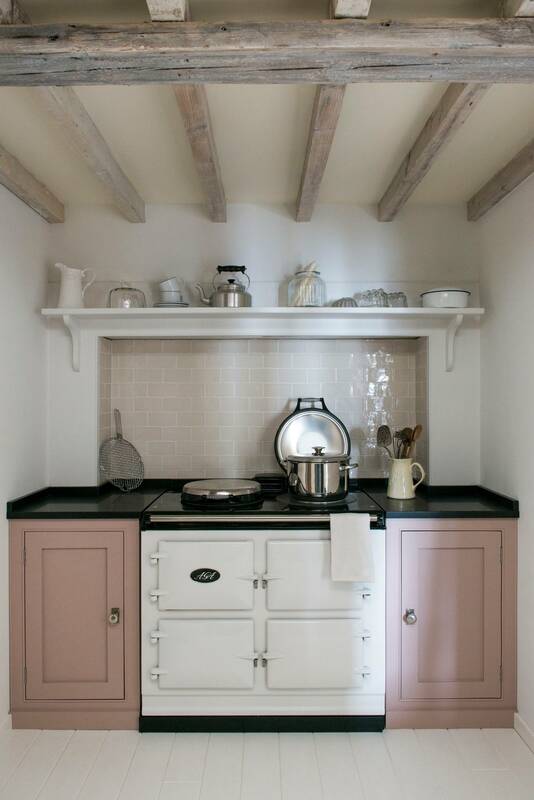 knew that the warmer shade of pink will blend with the wood tones in this rustic kitchen. 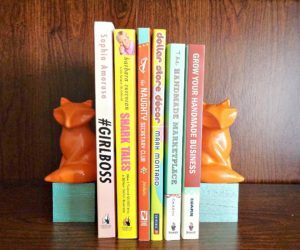 Take your blush, add a little orange tint and you’ve got a pink that’s very close to millennial pink, punchy and pretty at the same time. 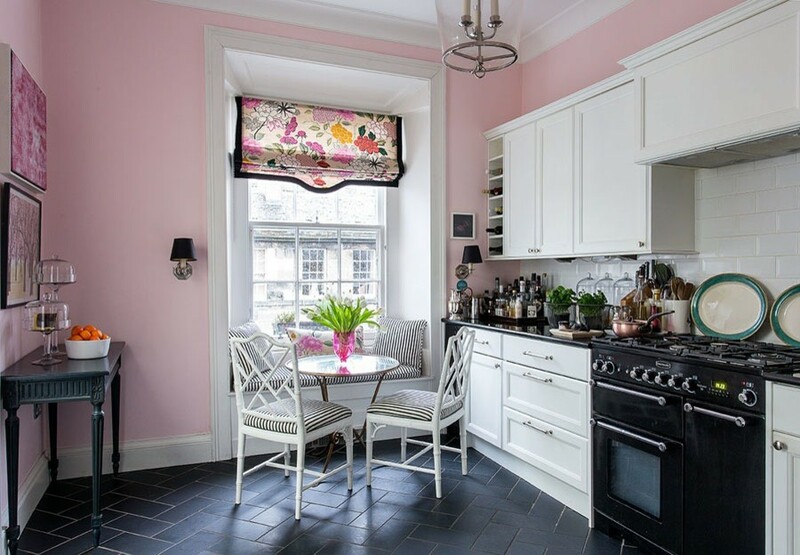 pairs their pink with chic shades like black for a grown up look in an otherwise girly space. 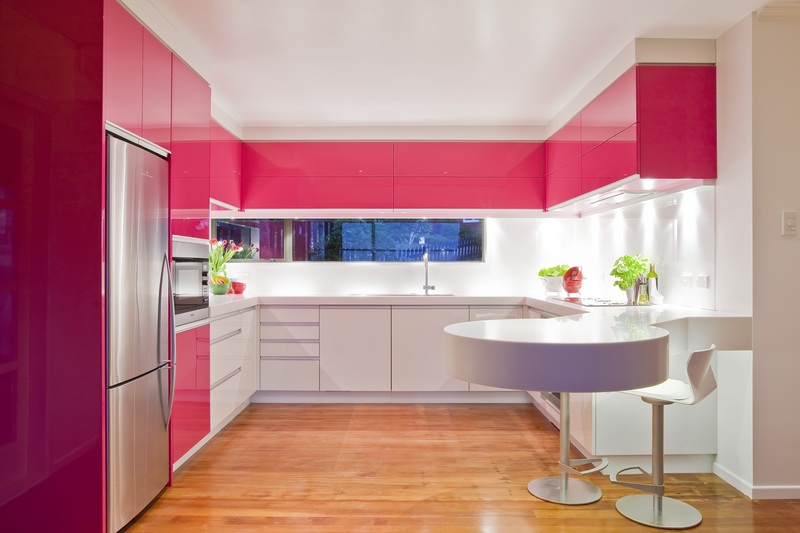 Hot pink is definitely a rare color when it comes to home interiors, however maybe it shouldn’t be. 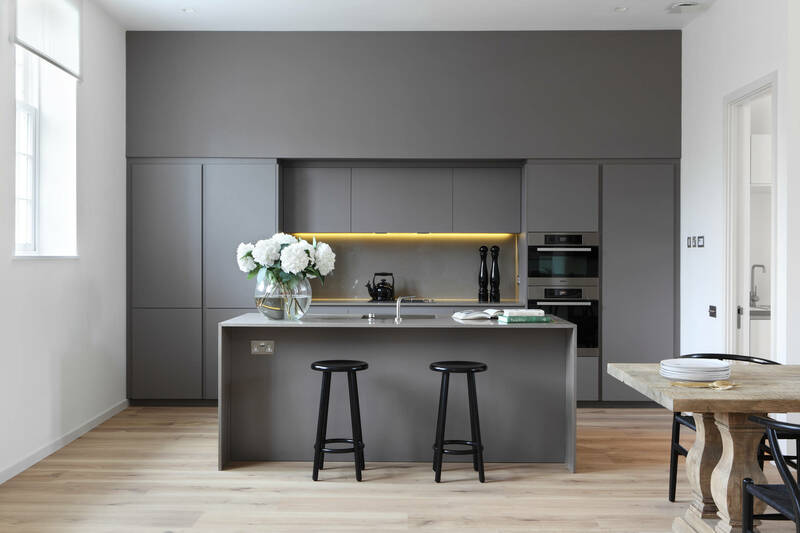 The two tone cabinets in this kitchen feel extremely minimal and modern. Maybe it’s all that shine. Putting together wood and pink is possibly the best idea we’ve ever heard. 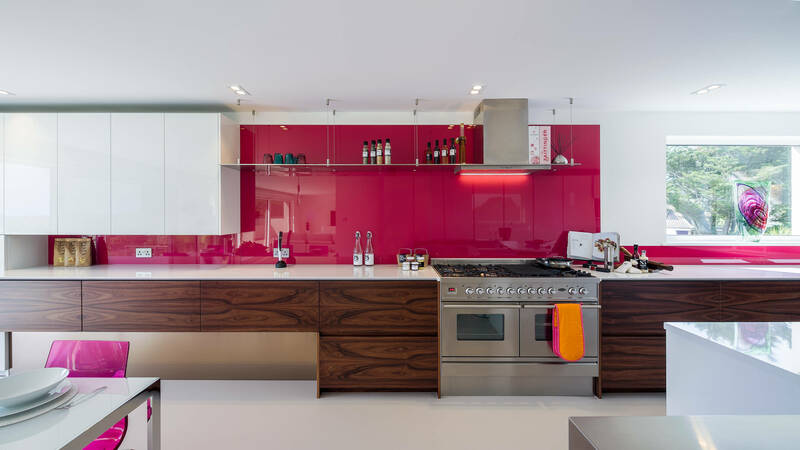 This kitchen takes the same sleek hot pink element and puts it on the backsplash. It’s like creating the best accent wall you’ve ever seen. 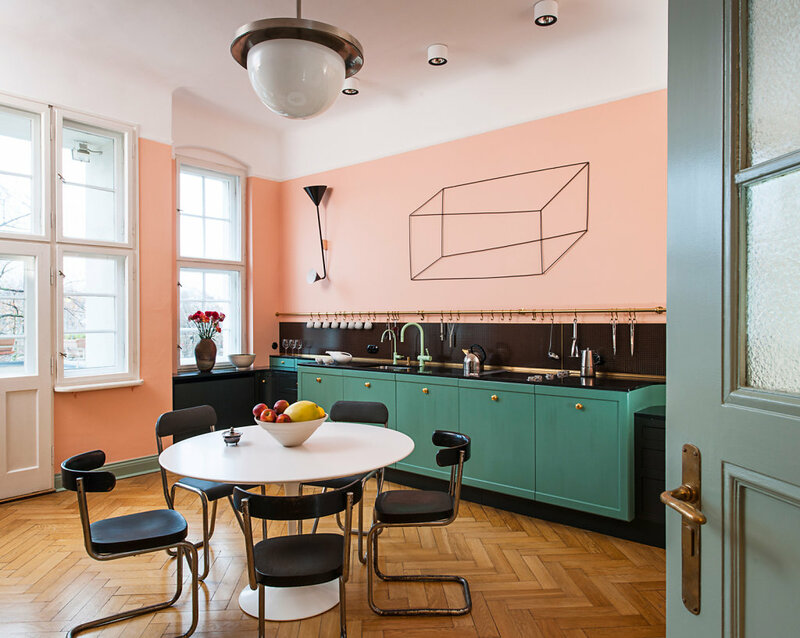 If you’re gonna have a pink surface, this kitchen by makes you wonder why not put a pattern on it? 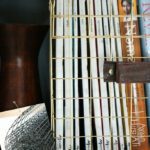 It adds some texture to the space without making any surface hard to clean. Maybe you actually like the pale nursery pink. If that’s just your style, take a note from and embrace it. You’ll be happy to know that they even make pink appliances to fill your need. Some of us have a non-pink-loving significant other. When you’re making decorating decisions with someone else, compromise is key. shows us that it doesn’t have to be a lot of pink to make a big impact. Settle for a pink island and some pink kitchen accents instead of a full fledge pink walls situation. You won’t be disappointed. Узнайте про нужный портал на тематику www.rbt.com.ua. Узнайте про полезный блог с информацией про http://rbt.com.ua.